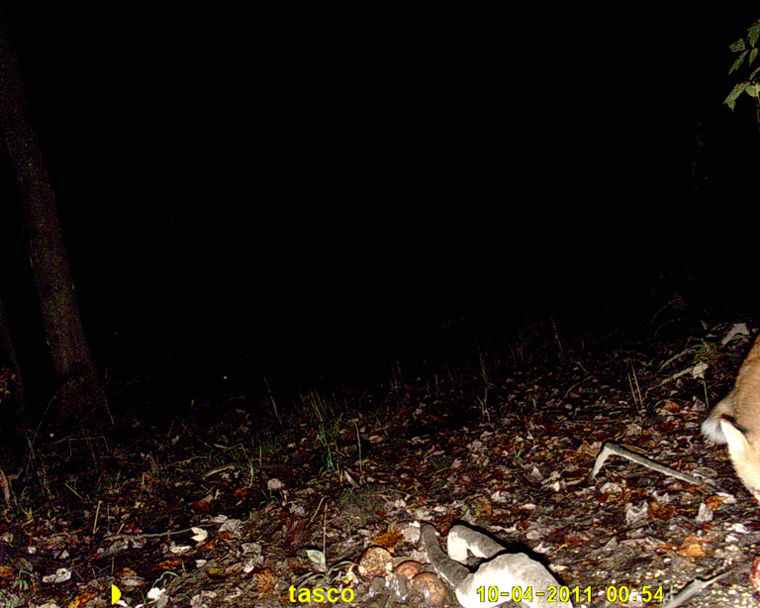 I checked the 3 cameras out behind the house and below is what was captured. 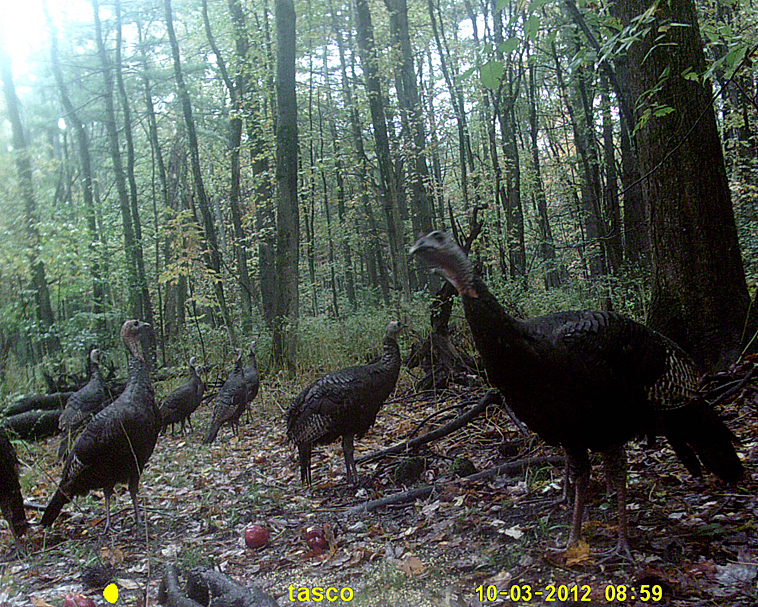 I got a million turkeys shots of a flock of hens at all 3 locations. 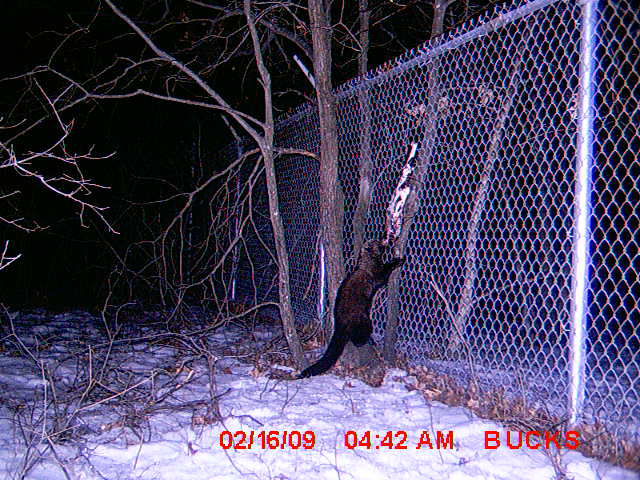 I also got what I think is a partial deer shot, my first fisher cat picture and part of some mystery animal, that I cant identify, can you? 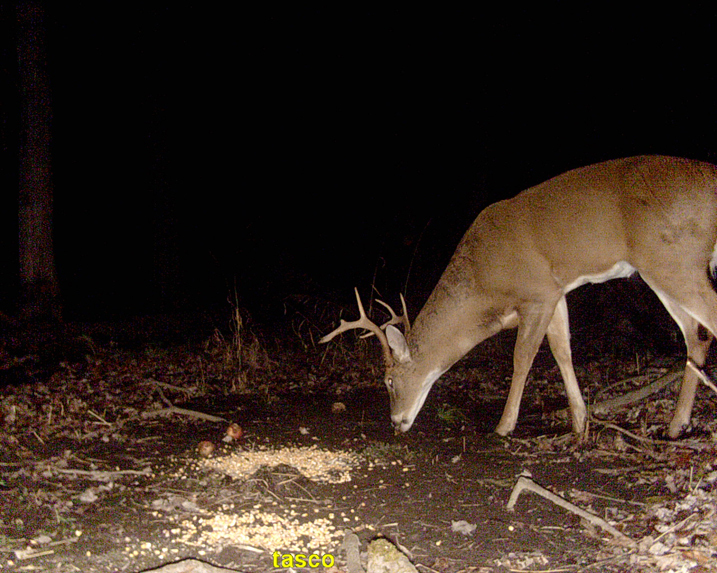 Not many deer this week, oh well. 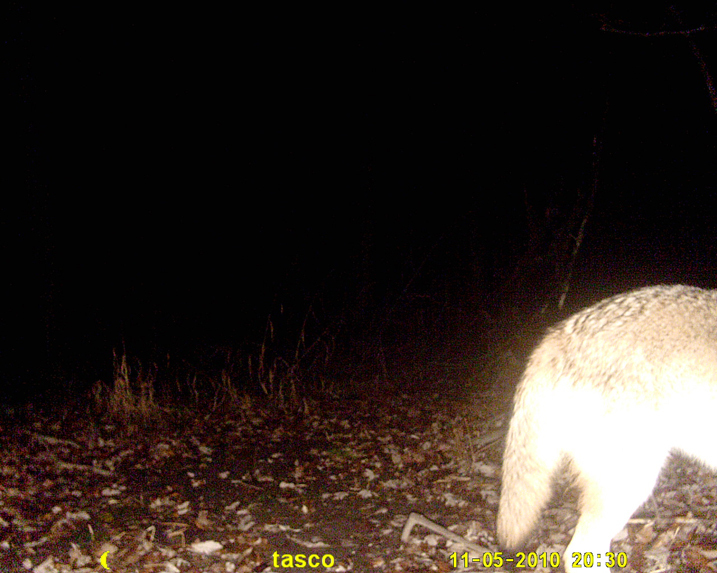 I DONT KNOW WHAT THIS IS, DO YOU? 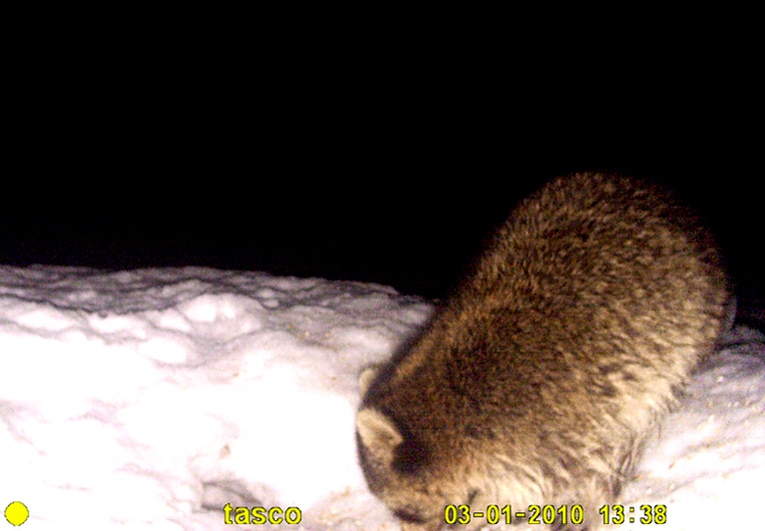 I checked the 2 cameras out behind the house again and was bummed out that one of them had been accidentally left unactivated, with fresh tracks around it. 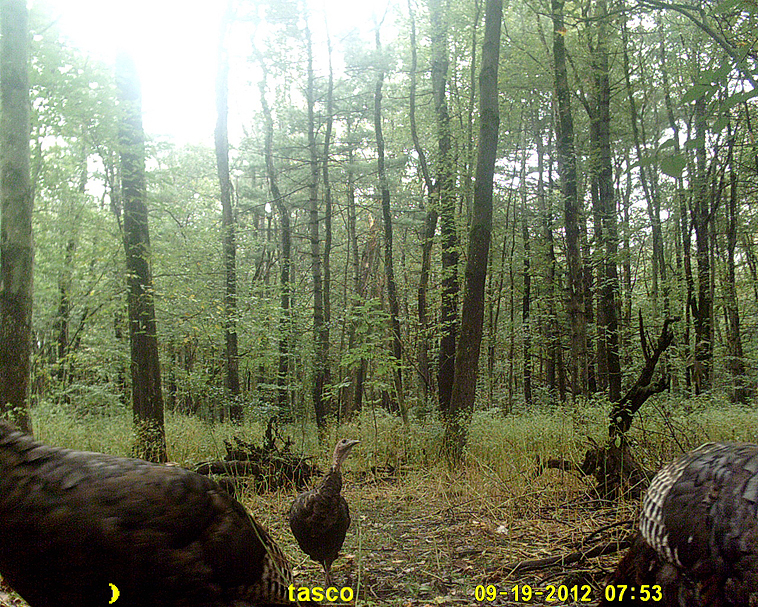 The other camera however picked up a couple of deer and some turkeys. 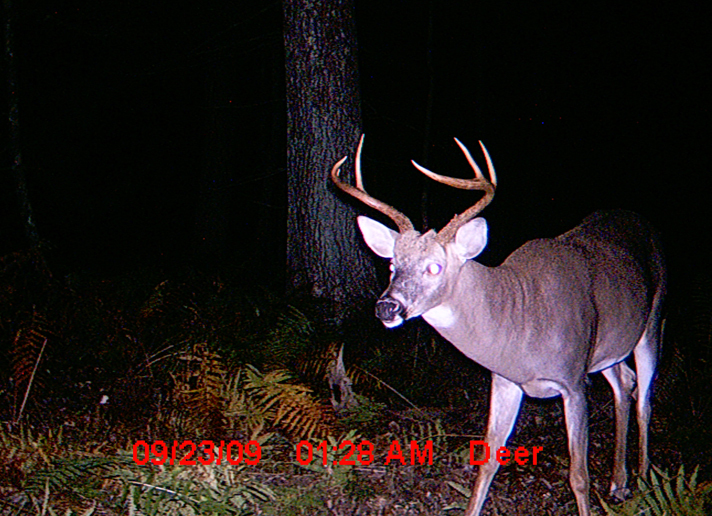 A friend and I just scored permission to hunt on a farm property. 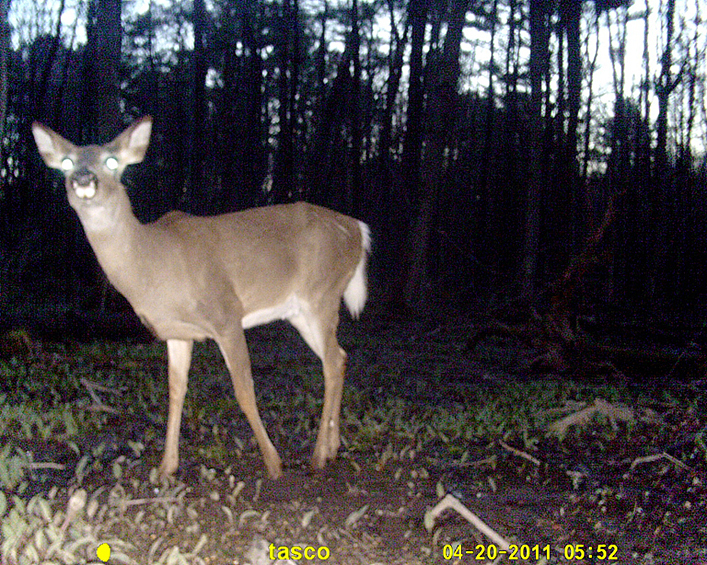 So I put a camera out on the edge of one of the crop fields and after a little more than a week I went back to check the memory card and while doing so a young (crooked jaw) doe feeding out in the field and I both got surprised when we both noticed each other. 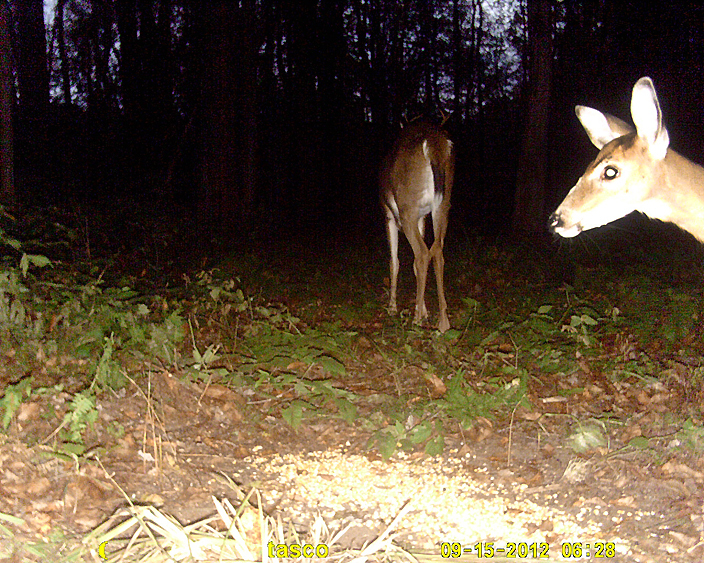 I was expecting her to bolt but instead she was curious and walked right up to me within 10 yards and stared at me for a while before she got bored and proceeded to go back to feeding. 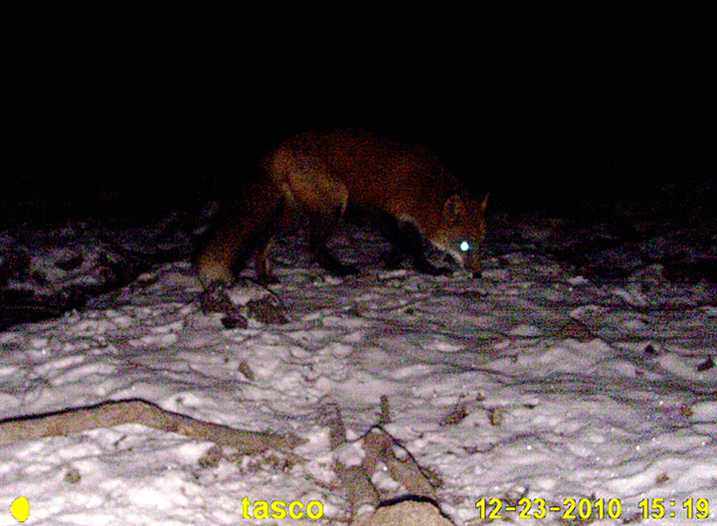 I managed to take some video of her with my camera phone walking out of the crop field to me, which I will post here soon. 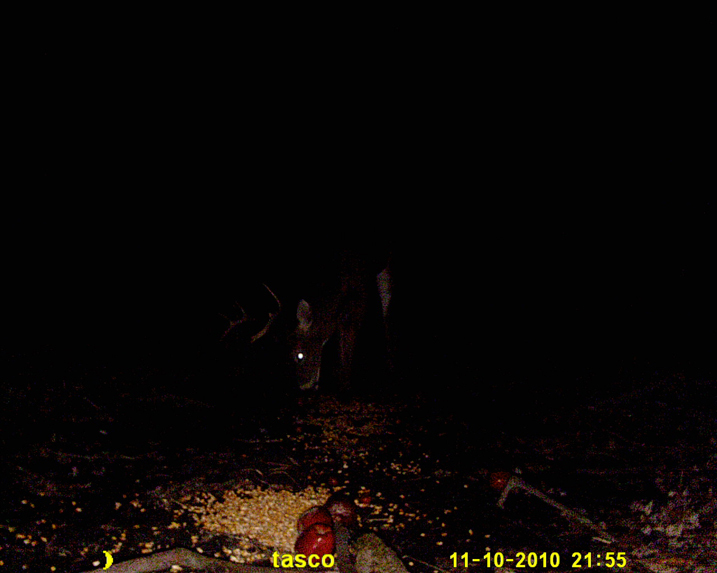 I have never seen a wild deer do this before. 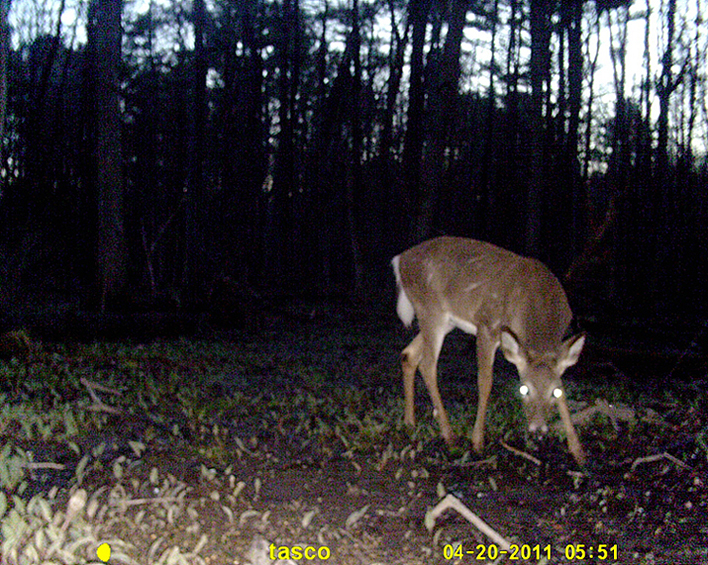 The trail camera also picked her up as well as a couple of bucks and another doe. 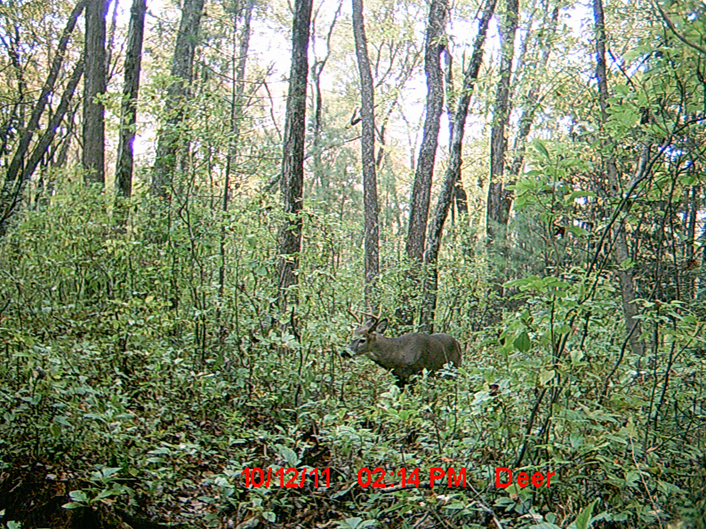 The farm is looking promising for the upcoming bow season. 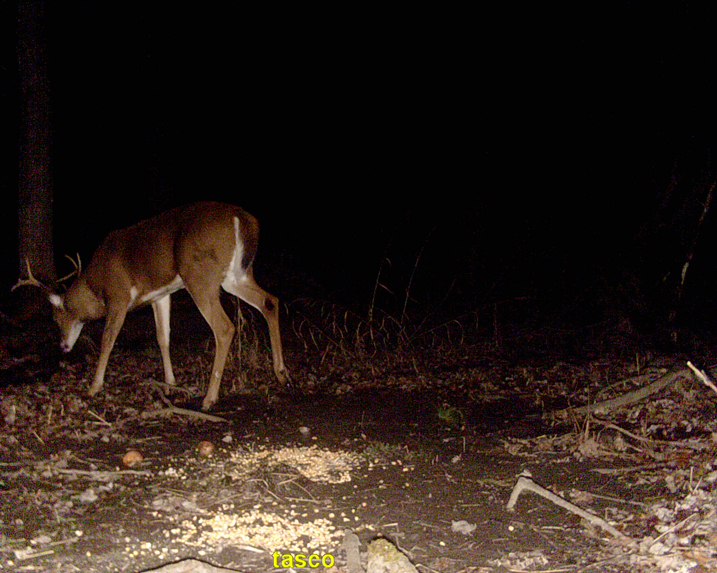 MEET CROOKED JAW, A YOUNG DOE I TOOK VIDEO OF OUT IN THE FIELD PREVIOUS TO THIS SHOT. 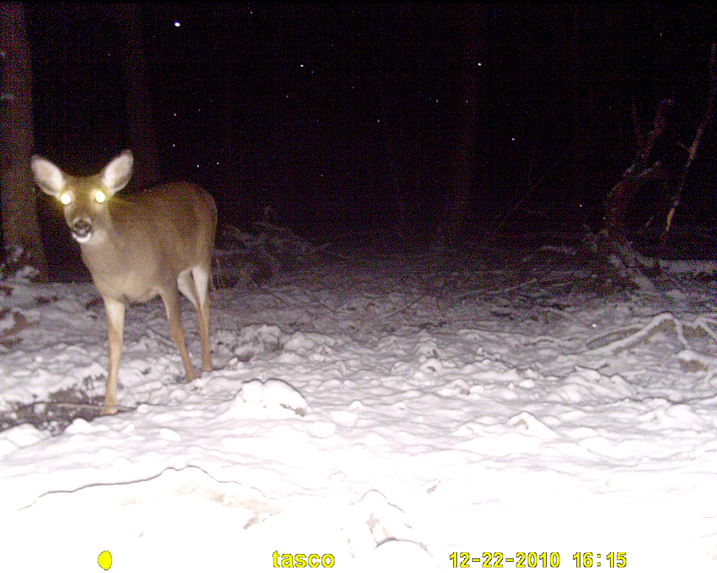 I put a couple of trail cameras back out behind my house. 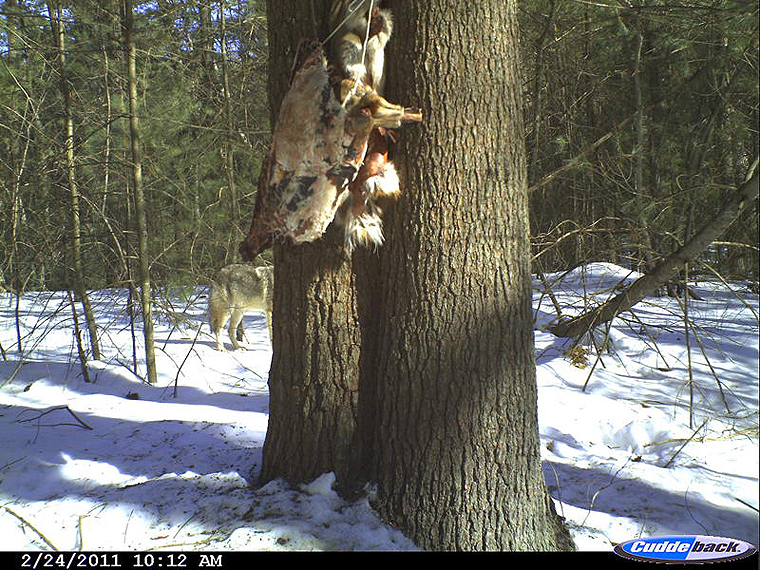 I checked them a week after hanging them and picked up a button buck in one location and a 4 point, fork horn and a doe (or 2) in another location. 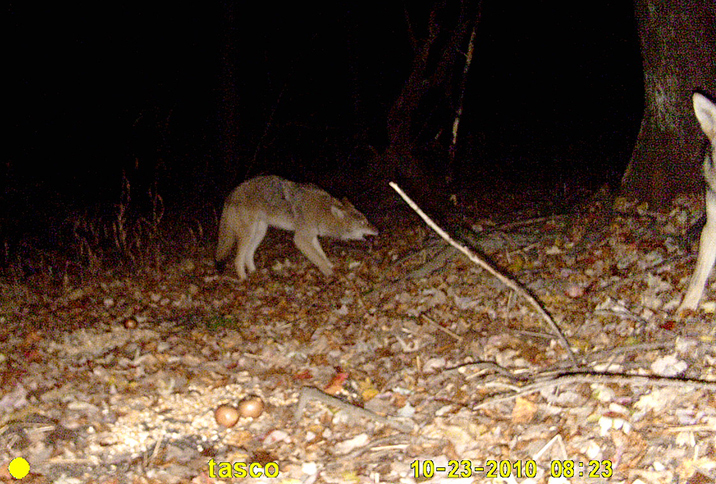 Hopefully they continue to frequent the area. 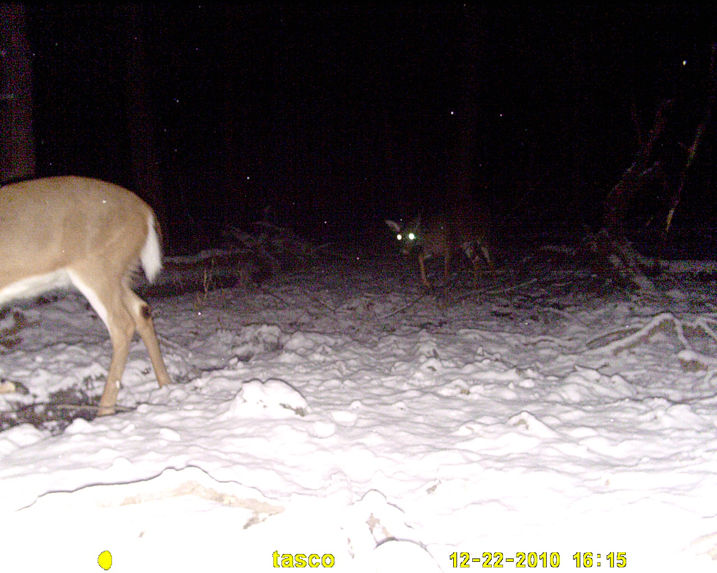 CAN YOU SPOT THE OTHER DEER? 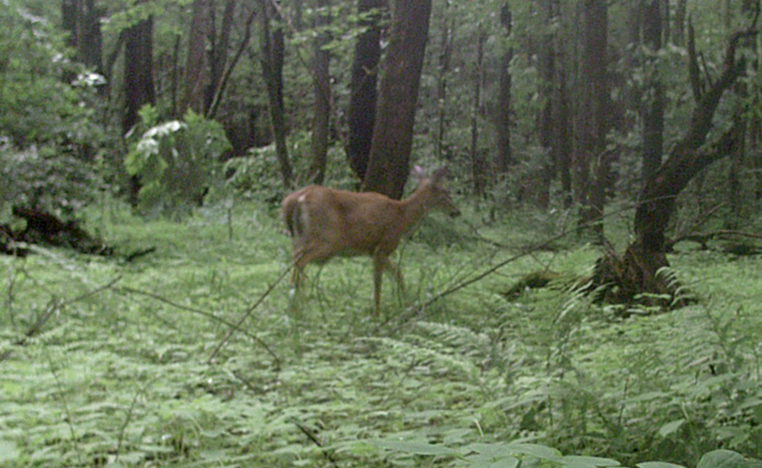 I left this camera out all winter and when I went back to pull it the vegetation around the camera had grown so tall and thick that the lens was completely blocked. 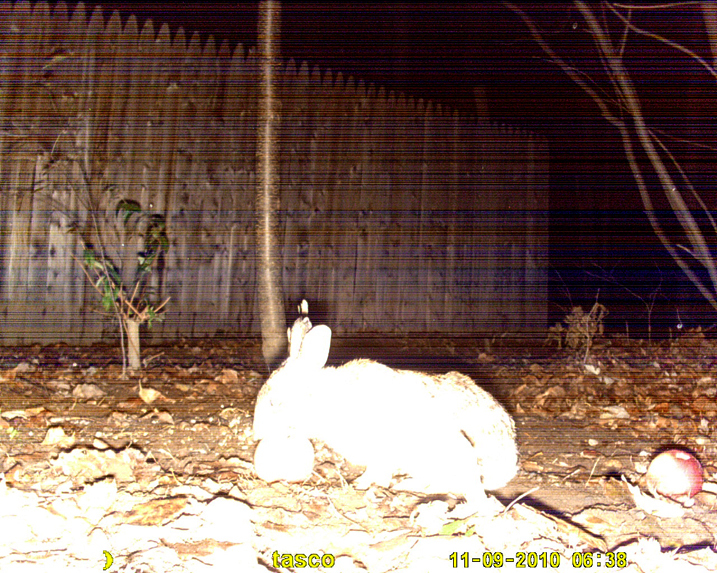 Which didn't matter anyway since the batteries were dead. 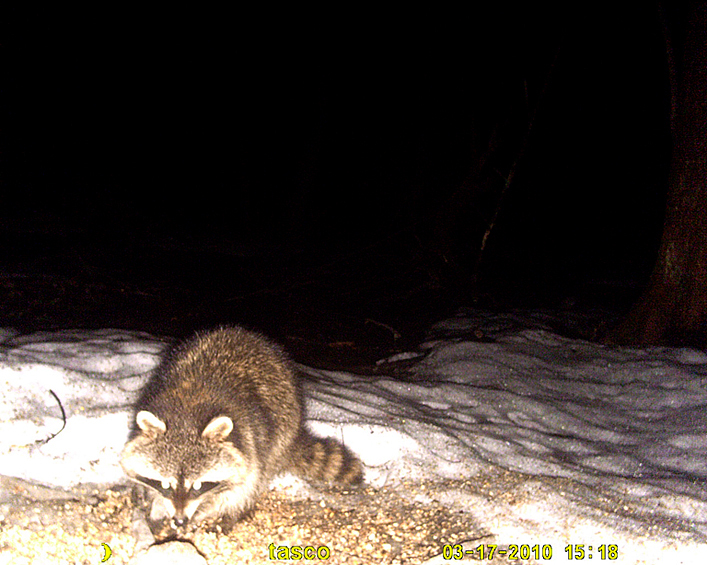 The only shot on the camera was of this little guy. 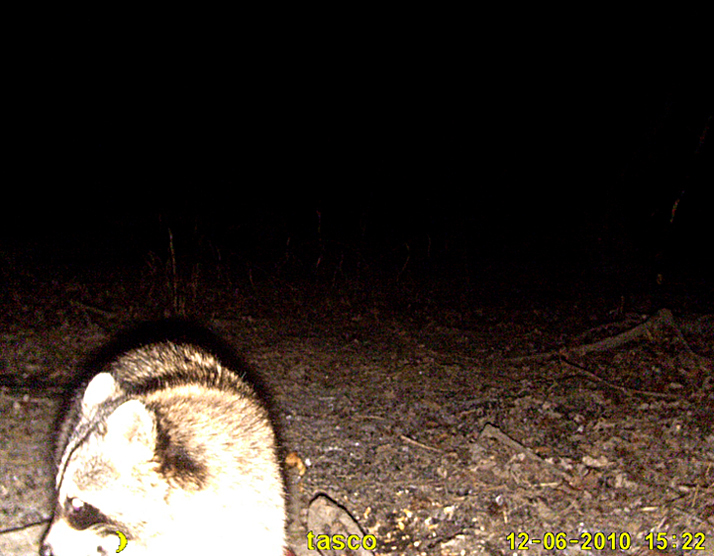 NOT WHAT I HAD IN MIND BUT MY FIRST POSSUM PIC. 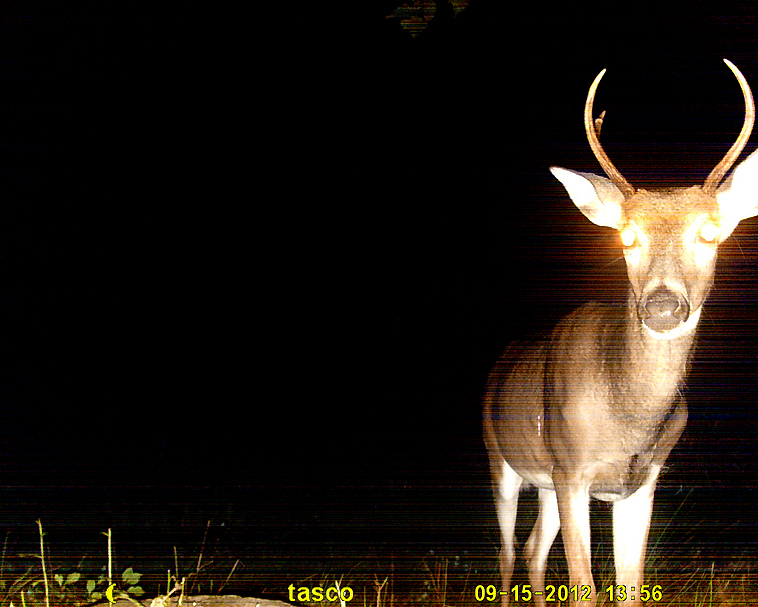 Checked my camera only to find this guy. 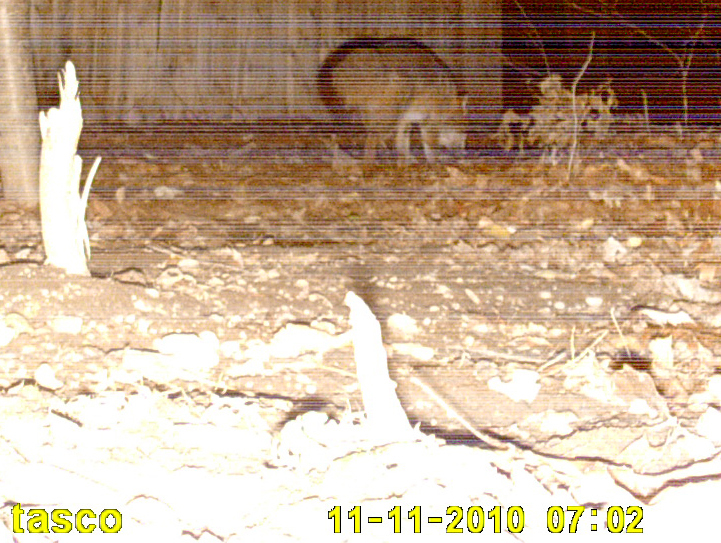 A coyote on the run. 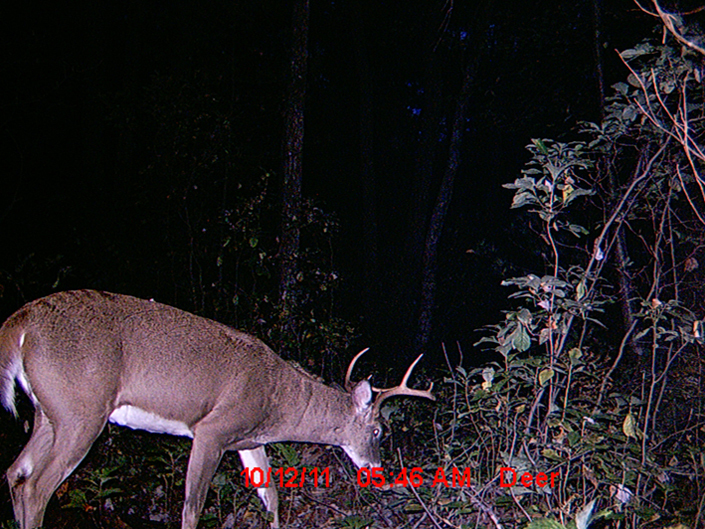 Next year I want to target them after deer season closes. 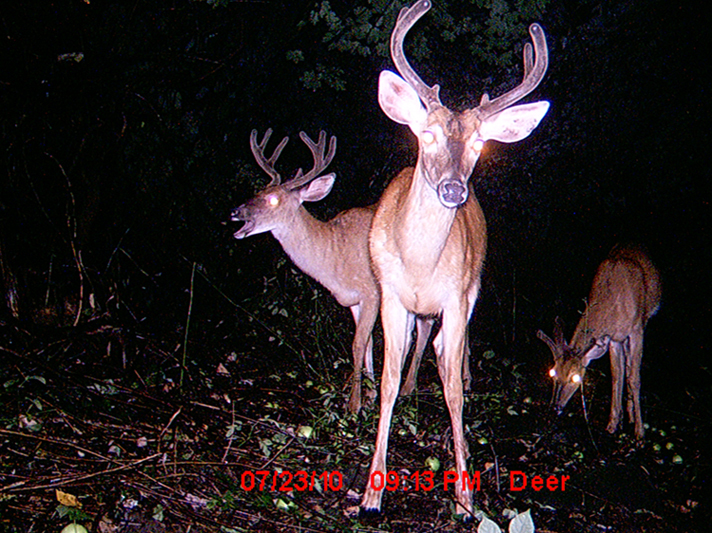 Don't know why I haven't yet, not like I don't know a good spot for them. 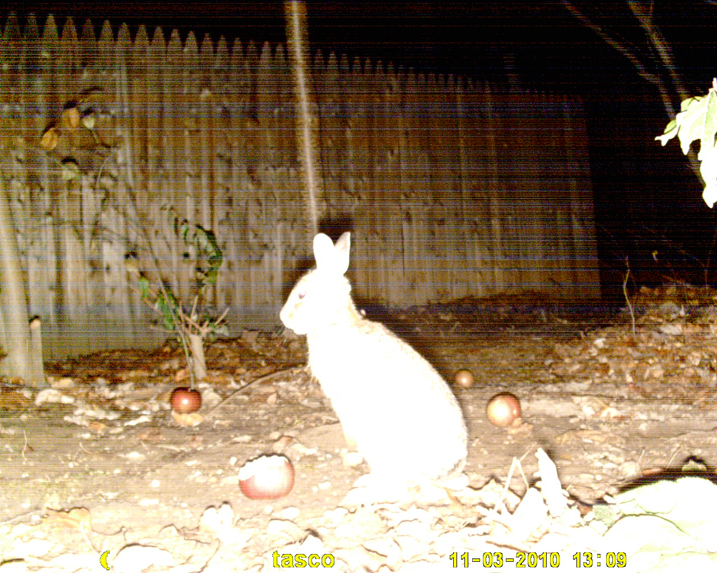 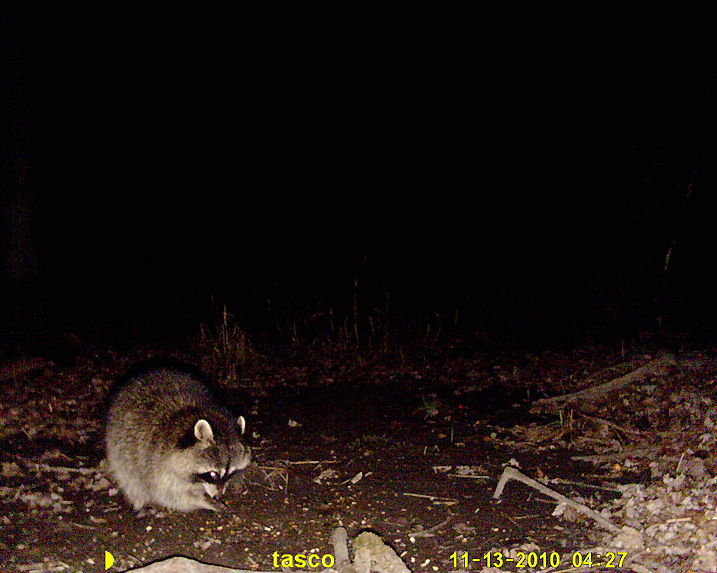 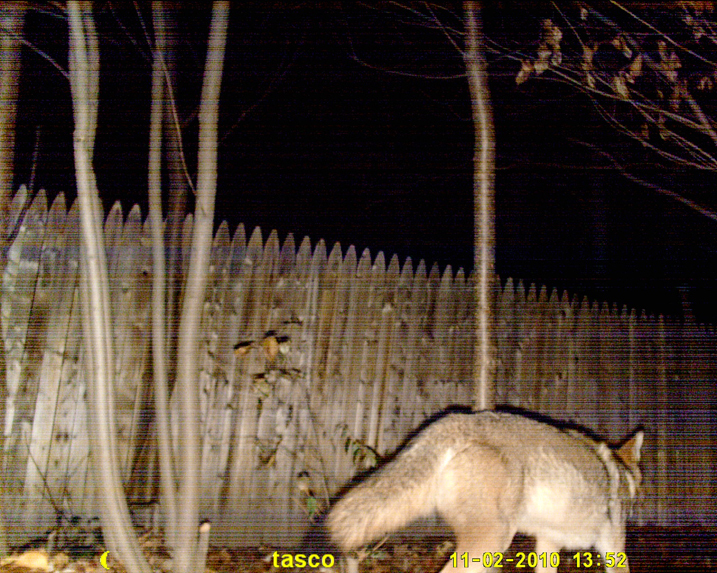 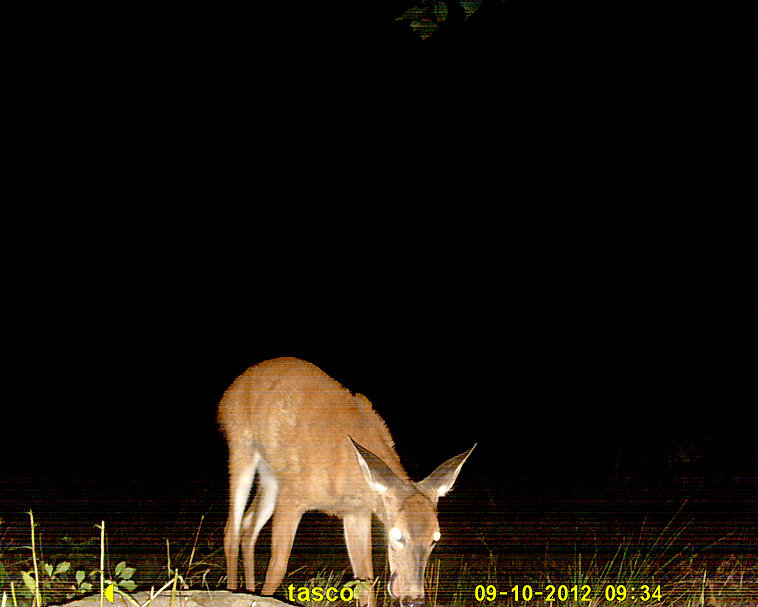 I never put up my other cameras but recently checked the one trail camera set up behind my home. 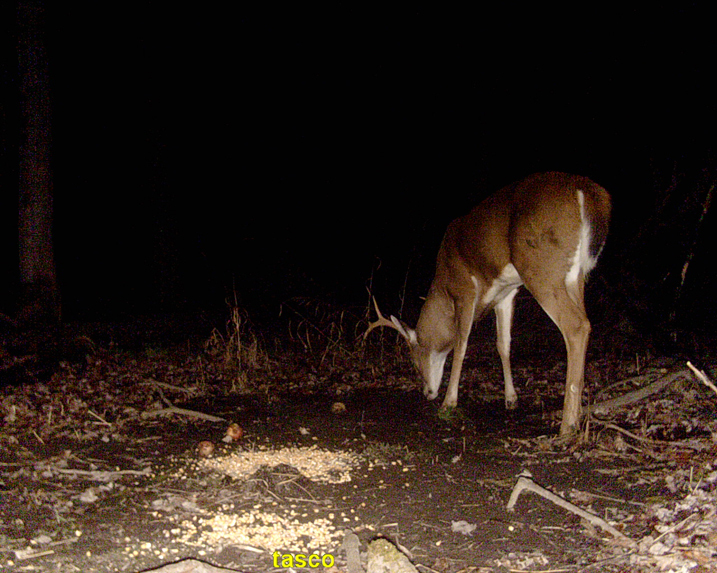 CAN YOU FIGURE OUT WHERE THE DEER IS BELOW? 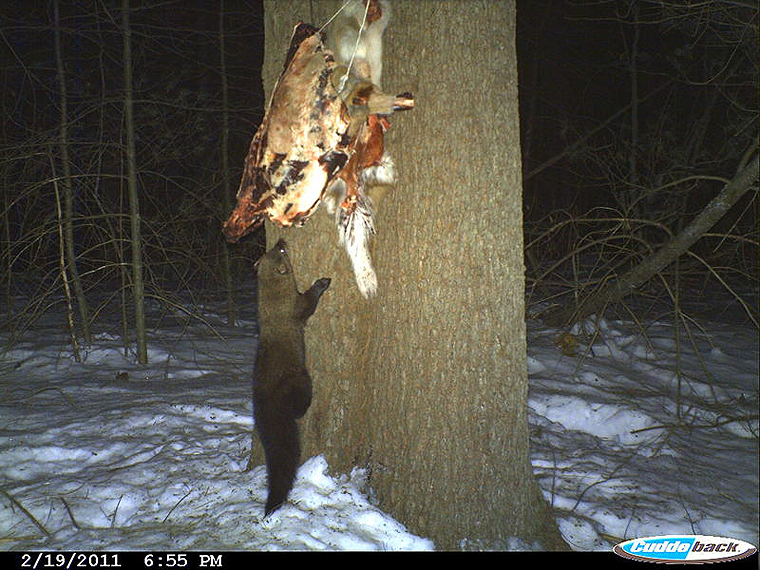 My friend Peter sent me some shots he recently captured on his camera. 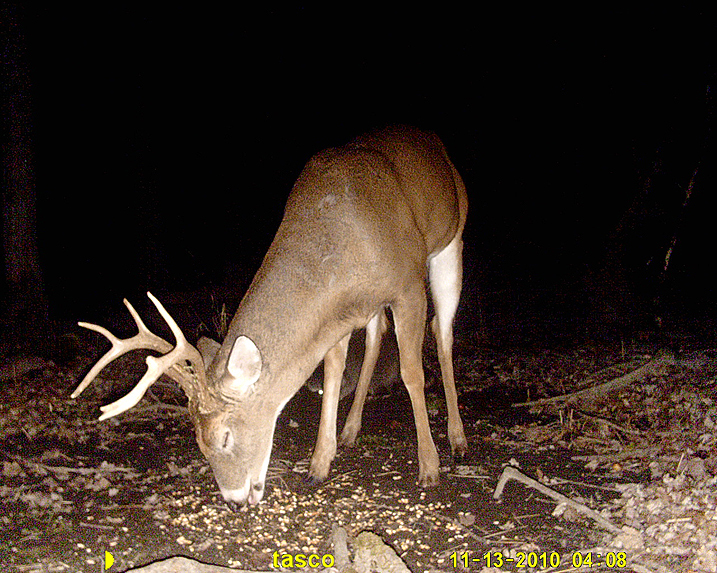 Some decent bucks for sure, now if only he would let me set up in stand in those areas...LOL. 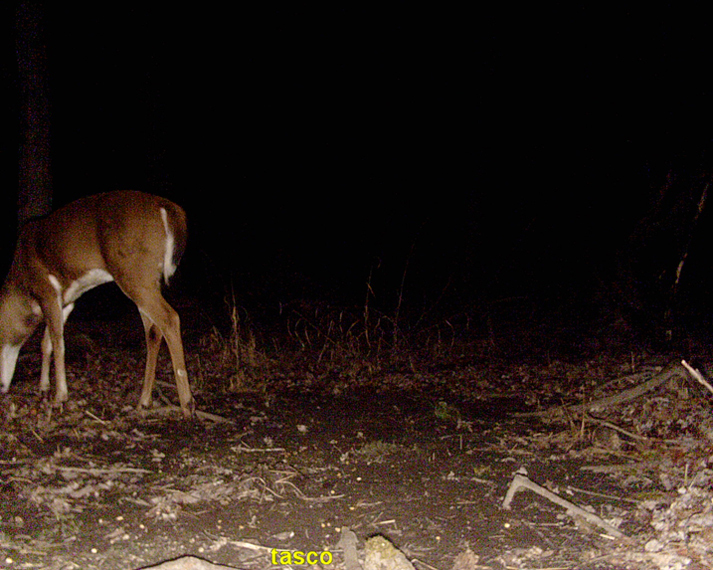 I checked the one trail camera behind the house I still have up and captured one deer shot. 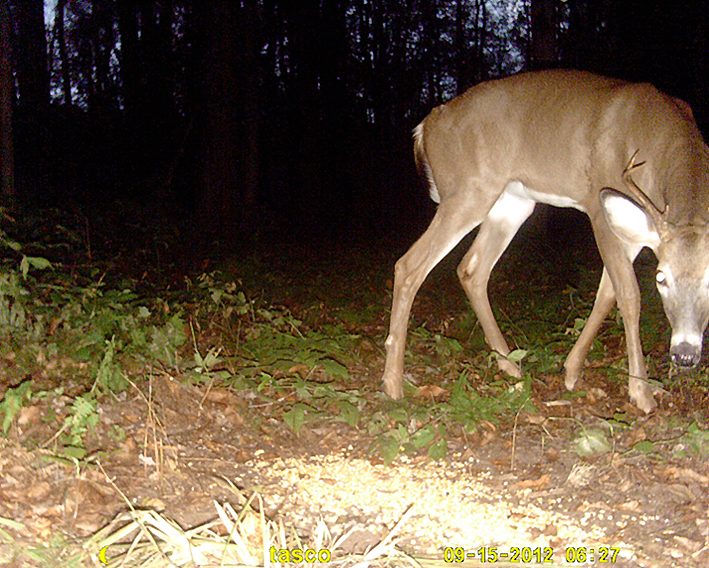 Looks like a pregnant doe. 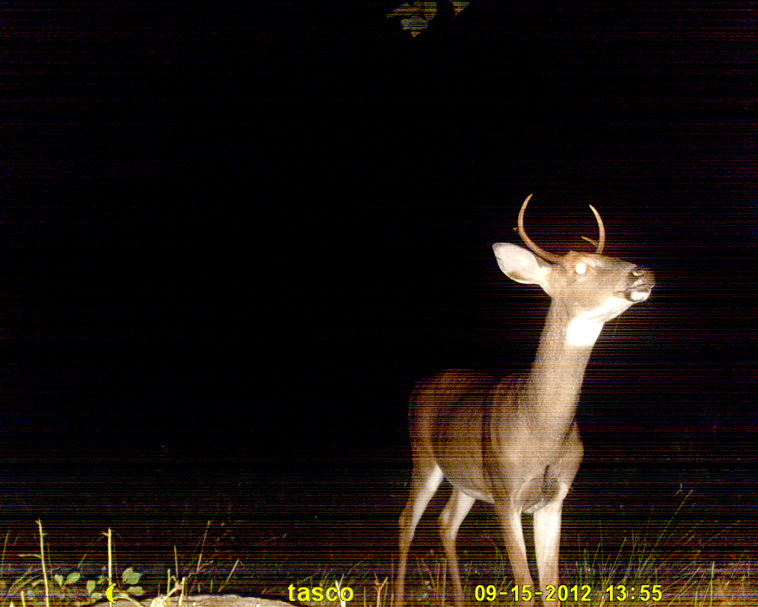 Hunting season will be here soon so I will need to get the rest of the cameras up. 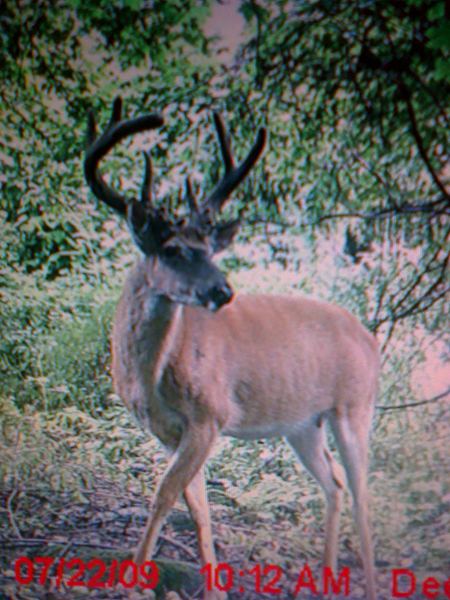 Look for more pics soon. 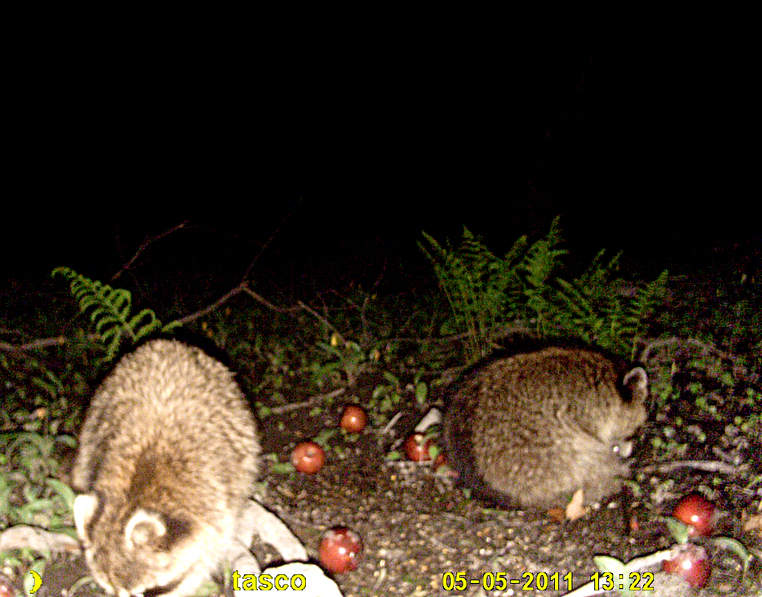 The raccoon's are back again and again. 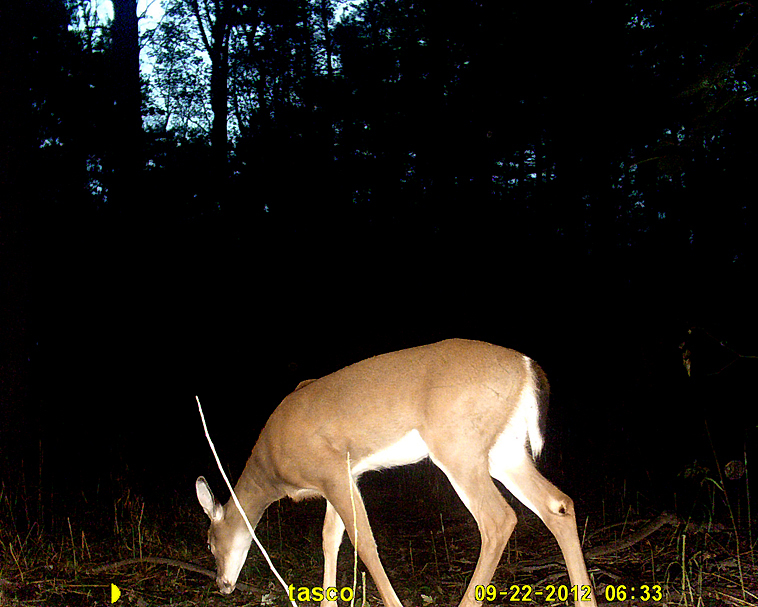 Still not much else coming around. 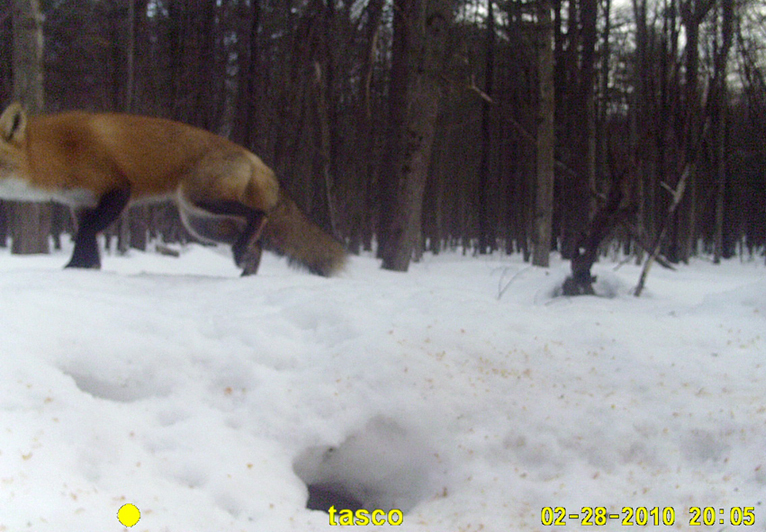 Decided to head out behind the house and into the woods today and hit the stream to collect some big bait for tomorrows Quabbin Reservoir trip but before doing so on the way to the stream I checked the one trail camera I still have up and below are some of the recent pics. 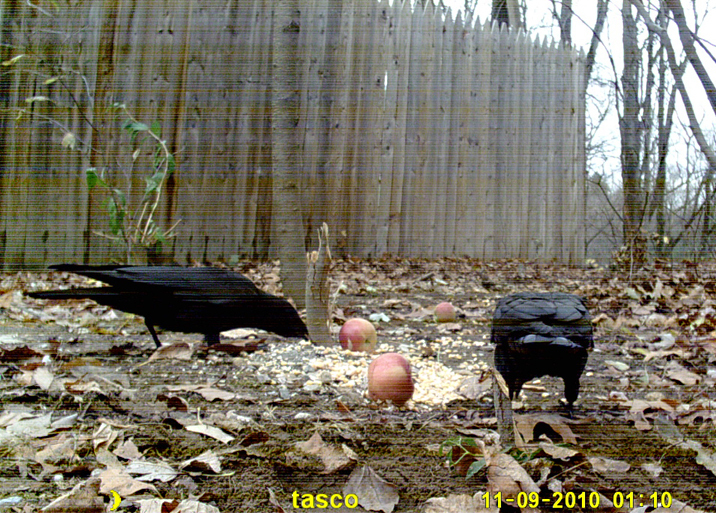 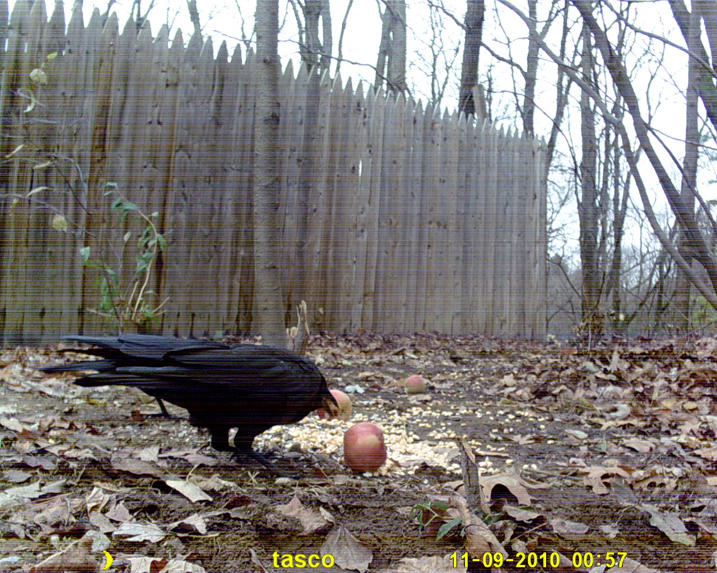 I put out some food hoping to attract more game and acquire more shots. 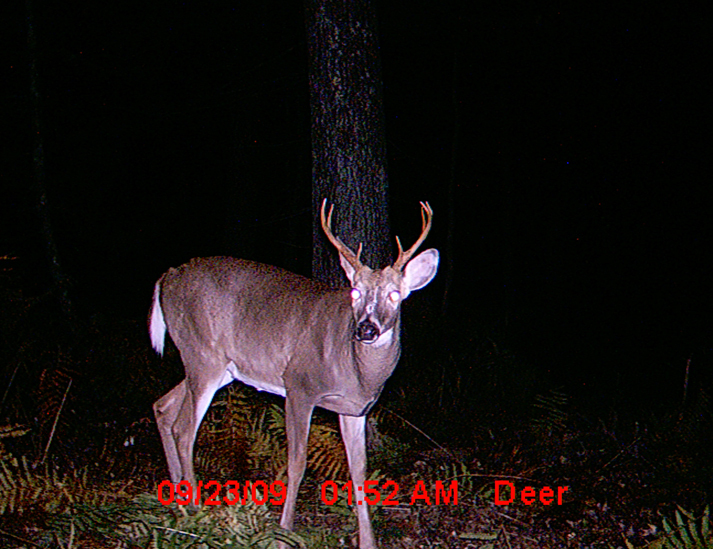 I plan on putting out the other 3 cameras I have soon (I took them down sometime ago). 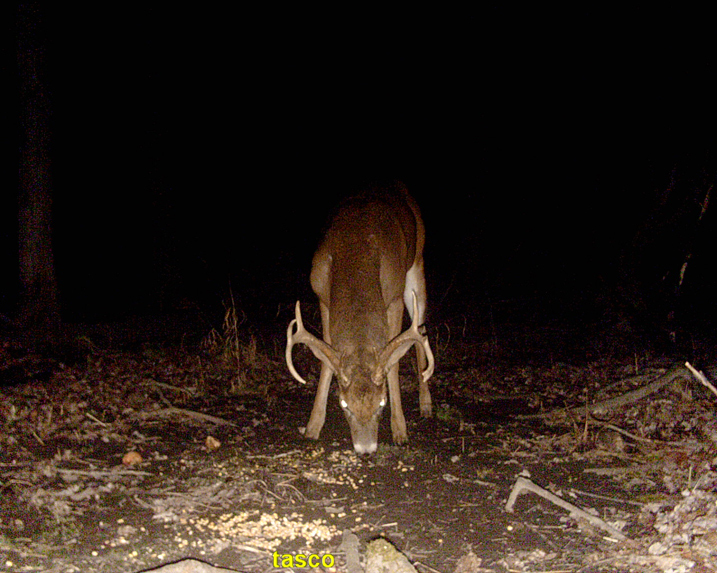 More pics to come, so check back. 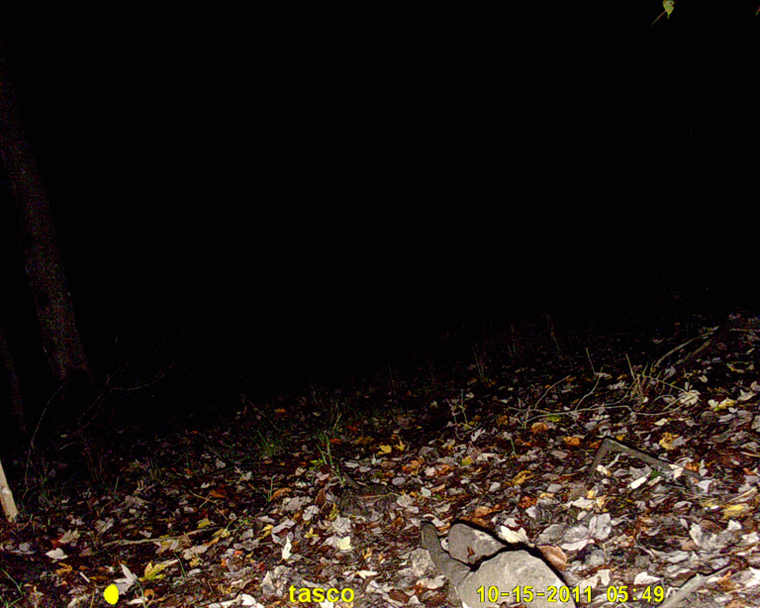 Decided to go look for deer sign and sheds out back behind my home and also check my trail cameras and stands, to see if everything was still in tact and hopefully not stolen. 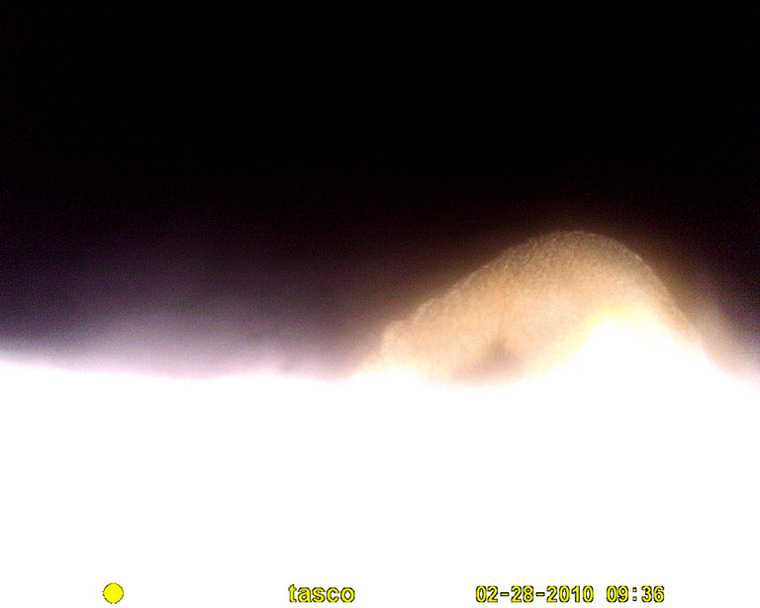 Luckily everything still there and fine, I pulled two cameras down and threw them in my back pack in order to change the batteries and move them to hopefully better locations sometime within the next couple of weeks. 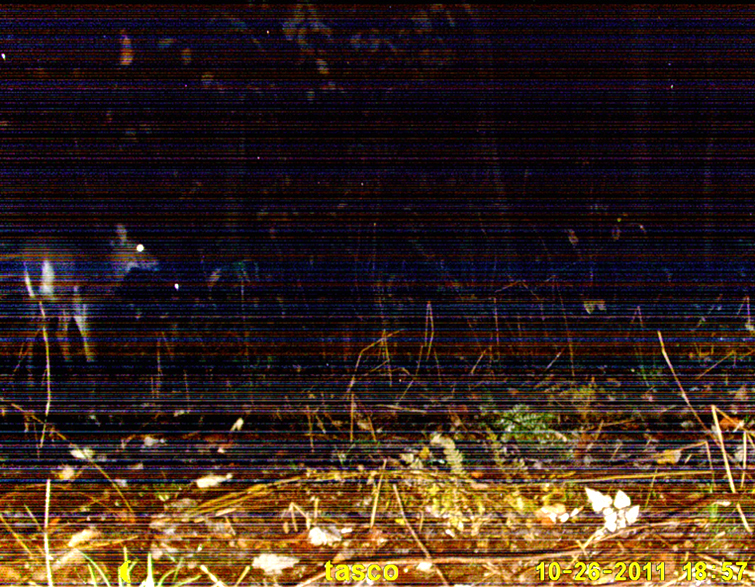 The two cameras I pulled down showed no images except of me (not what I had in mind). 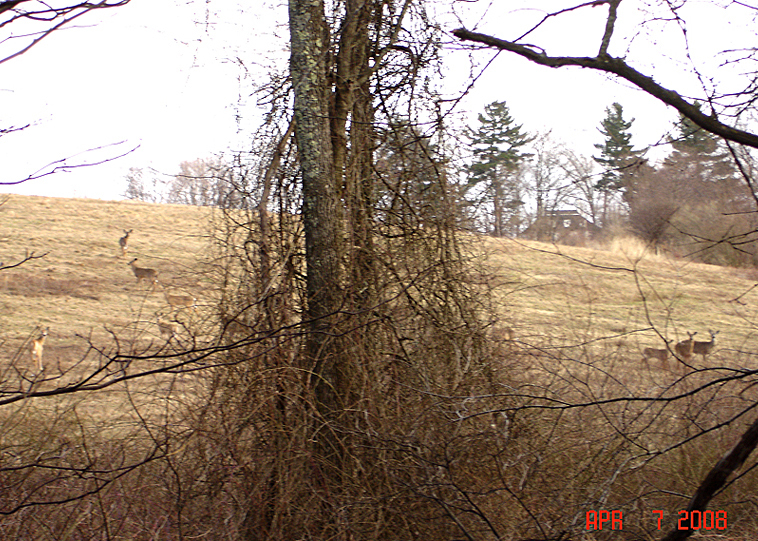 Hardly any deer sign and no sheds were found. 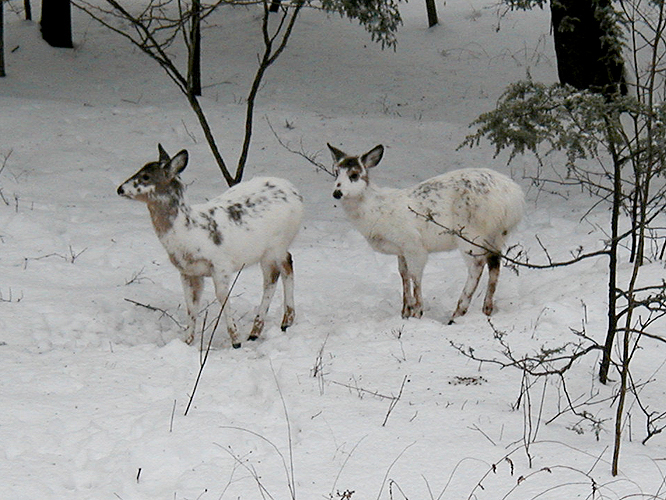 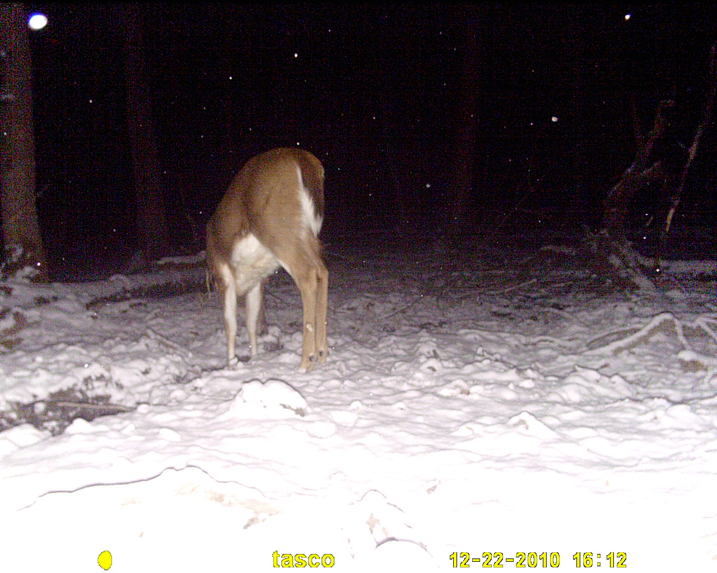 The deer clearly don’t yard up or hang out much during the late winter in my neck of the woods. 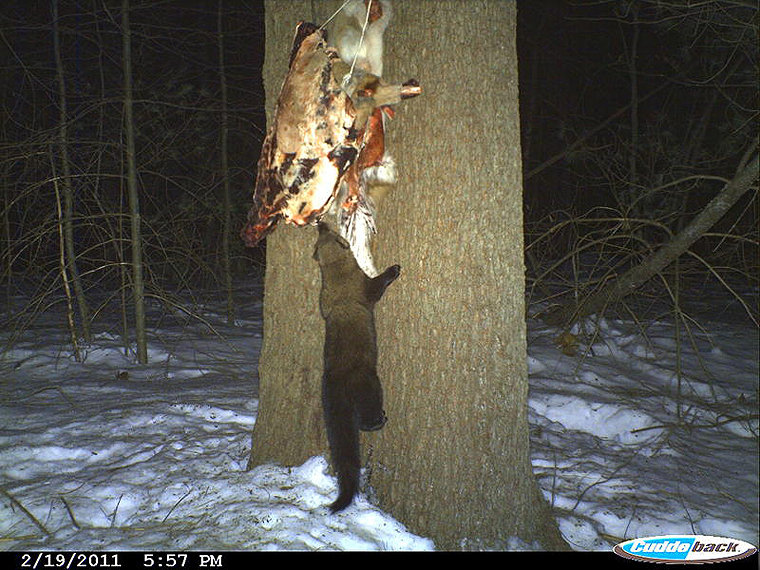 The next time I will go in further and deeper into the woods in hopes of better results. 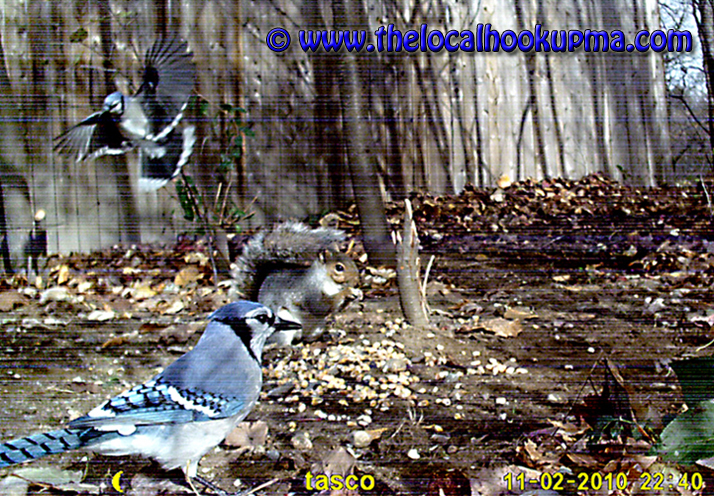 My third camera closest to my house seems to produce most of the pictures I have captured, so I left that one up and with the recent new batteries put in it should still keep it going for a while. 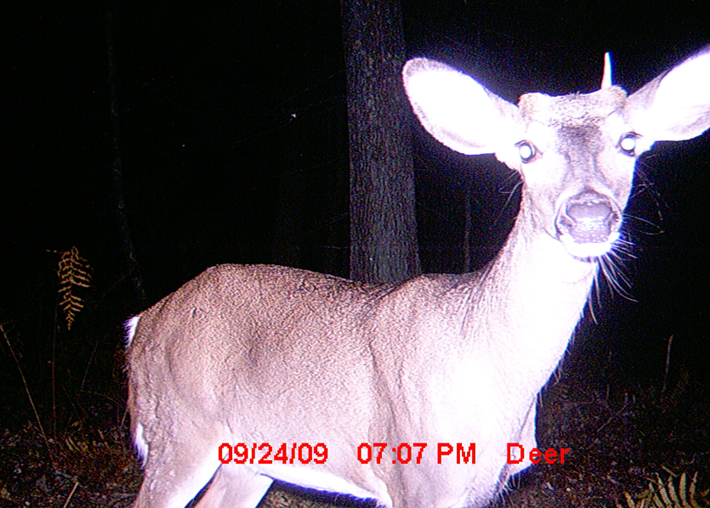 When I checked its memory card it was no surprise there were no deer pictures. 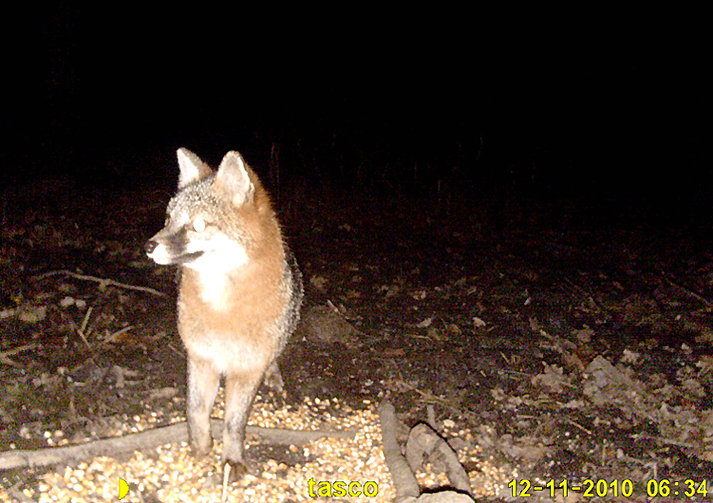 Though I was not disappointed, there were 5 fox pictures and 4 raccoon shots (although I could have done without the 200+ squirrel pictures). 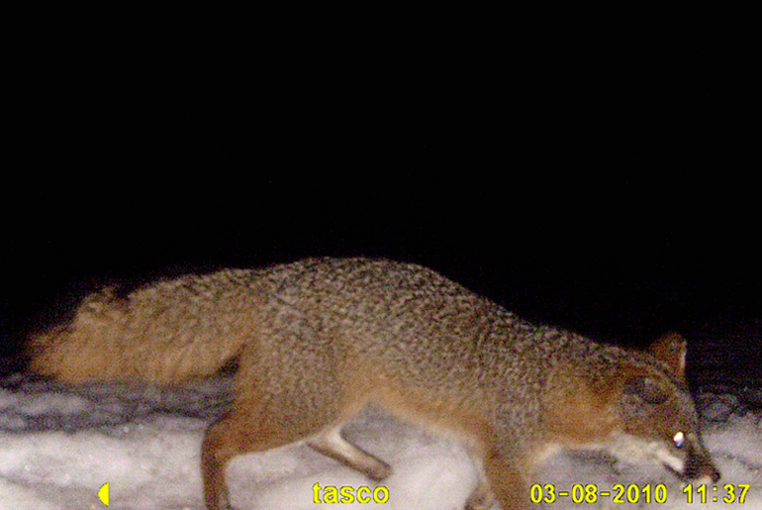 I’m wondering if the gray and red fox pictures I captured were the same animals I captured last year or if there different foxes. 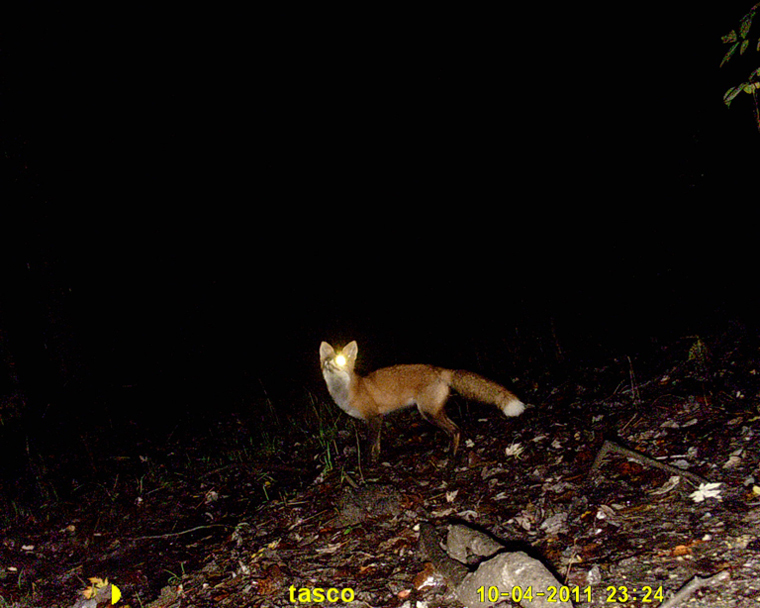 I also got my first daylight shot of a red fox. 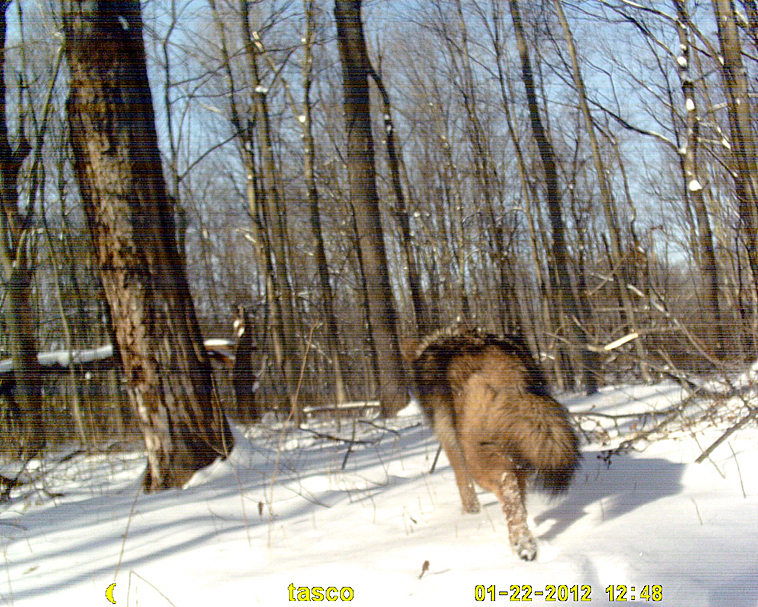 I plan on adding more cameras; it will be interesting to see what other shots I end up with over the spring and summer. 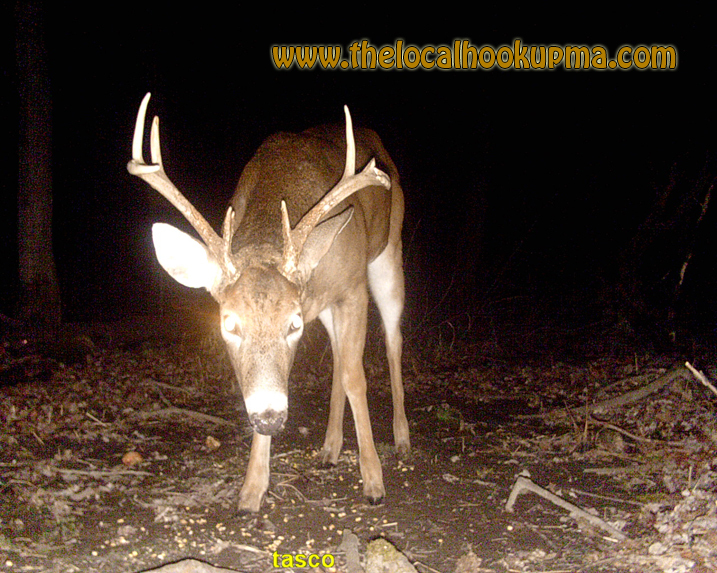 I will continue to post images throughout the year so check back. 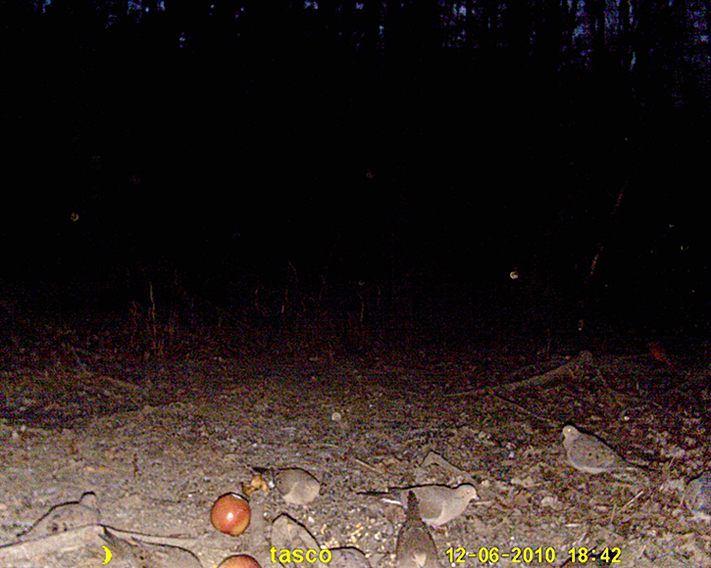 Below pictures I forgot to fix the year on the time stamp but the month and day are good (will correct next time out). 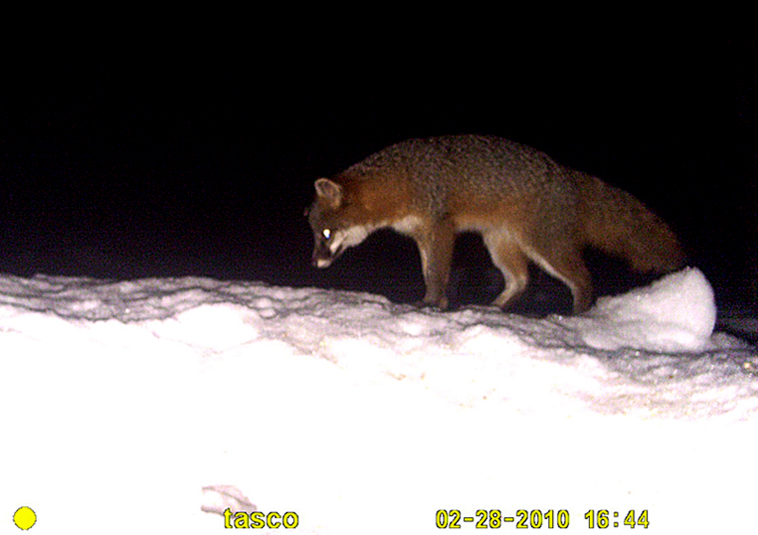 ?...PROBABLY THE GRAY FOX AGAIN. 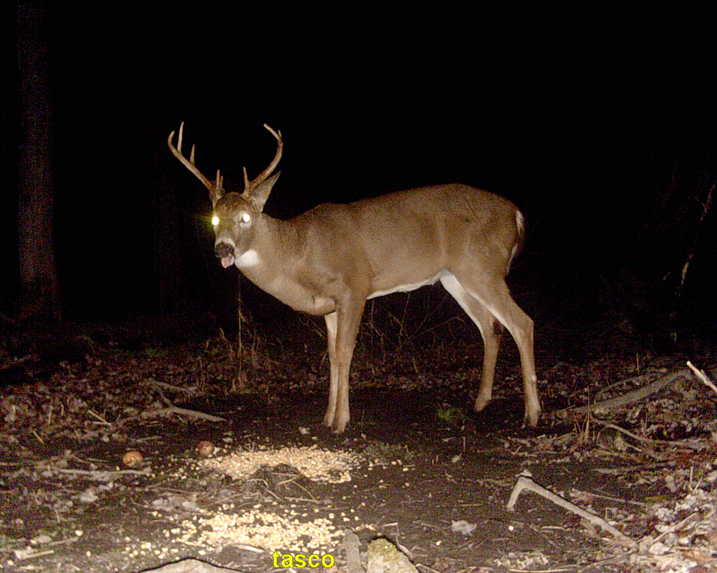 My friend Mark took a deer carcass from a rod kill and put it up in front of one of his trail cameras to see what it would attract for predators. A week after it was hung this is what he captured on camera (below). 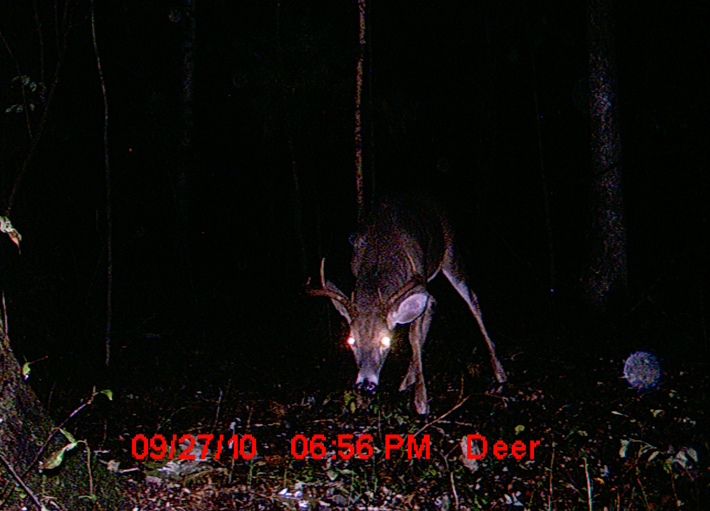 Aside from being an avid fisherman I’m also a hunter. 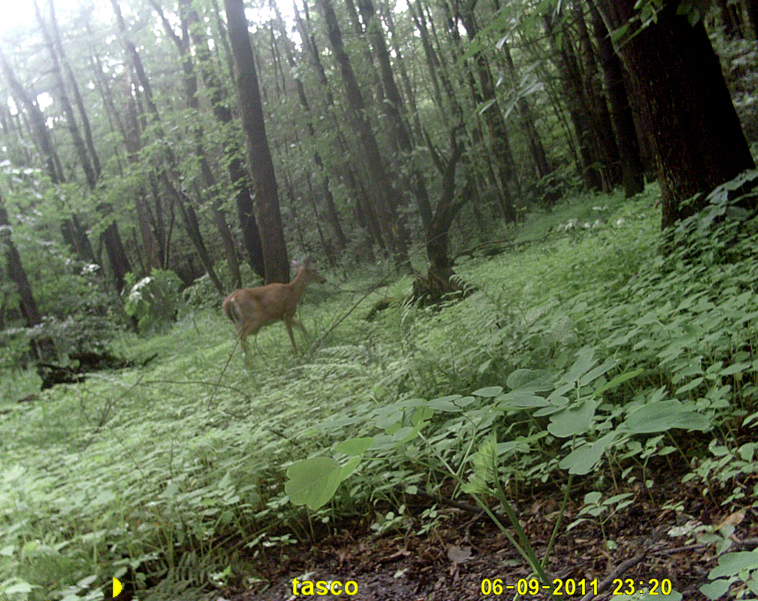 Directly behind my home is a wooded area, one of which I have bow hunted the past few years without seeing much. 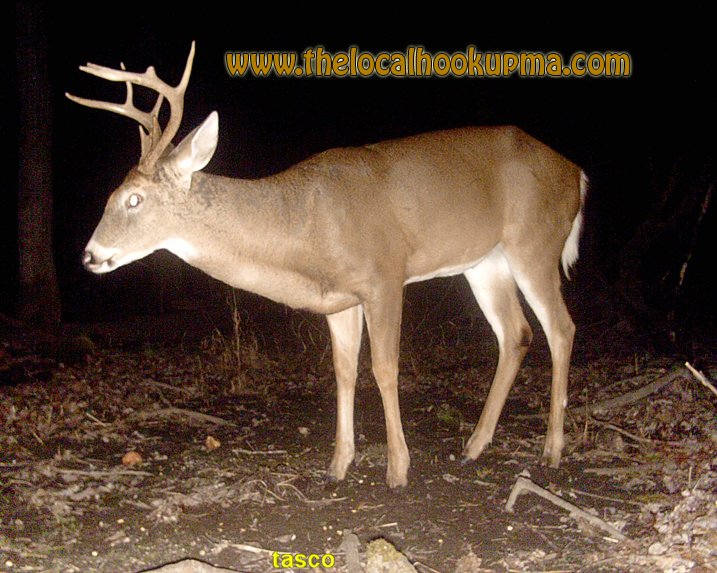 In fact I prefer to hunt many other spots versus behind my own home, simply because of the lack of wild game sightings. 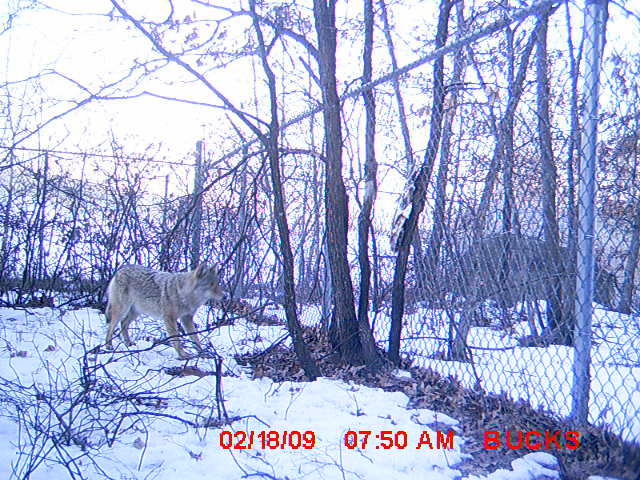 In past seasons scouting the area I found very little sign (even after snow or rain). 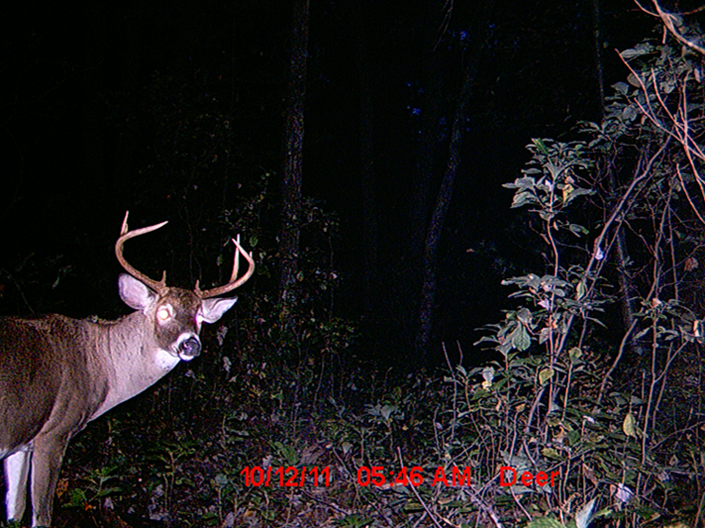 This past season I noticed an increase in sign and decided to purchase and put up my 1st trail camera. 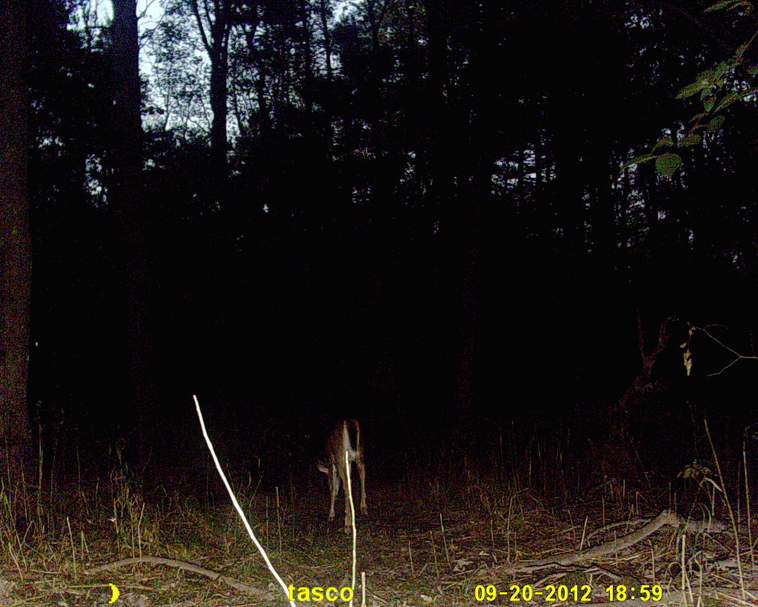 I set it up just behind my home and not all that far in the woods. 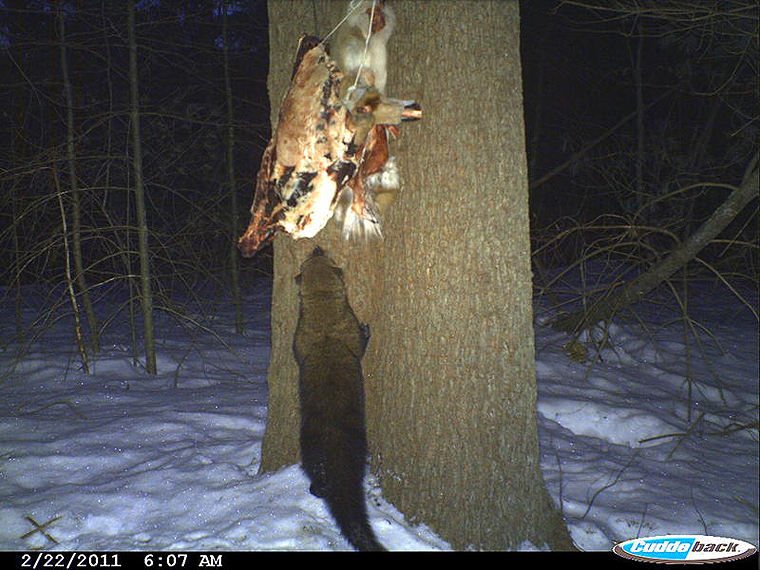 The point of hanging the camera was originally just to see if there was any life out there and not so much for hunting. 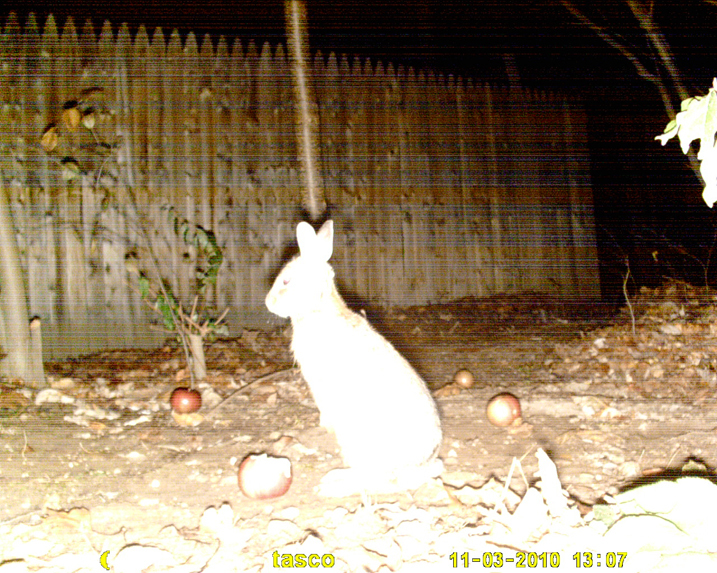 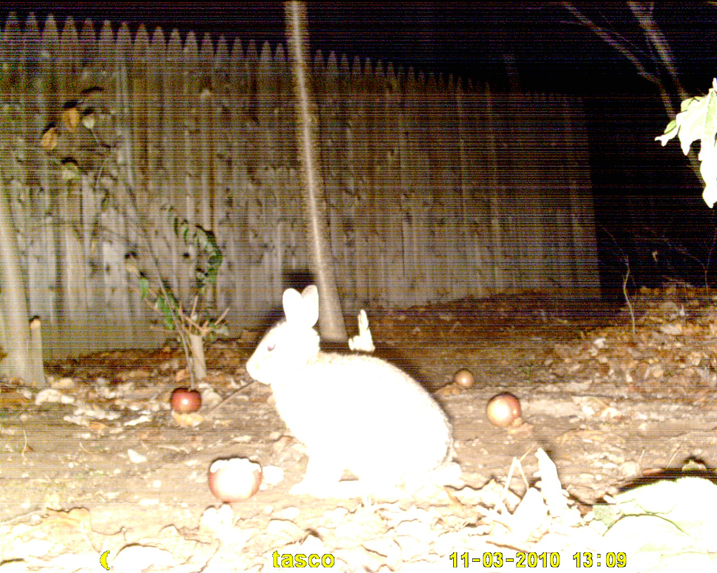 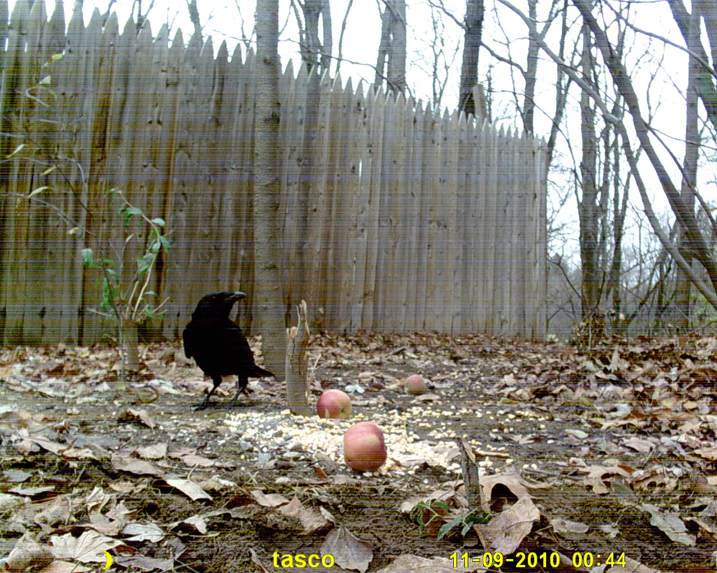 The plan was also to place a continuous supply of either apples or corn in front of the camera to entice the animals in not being camera shy. 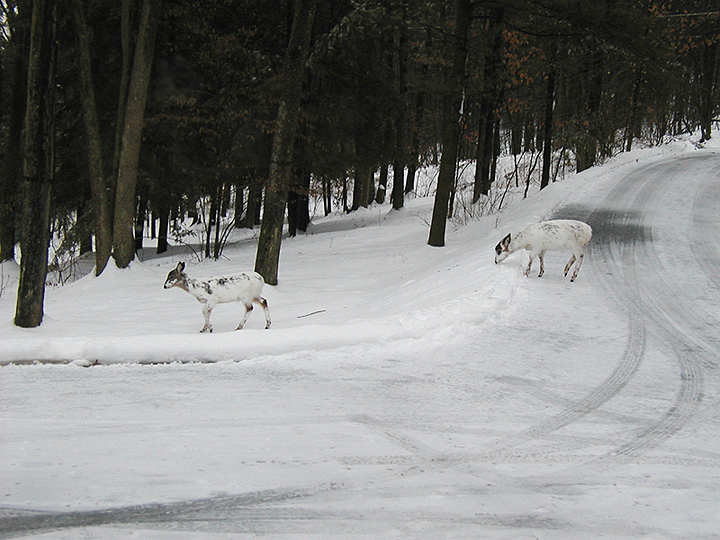 But between all the hikers, ATV and dirt bike riders I really was not expecting to pick up much. 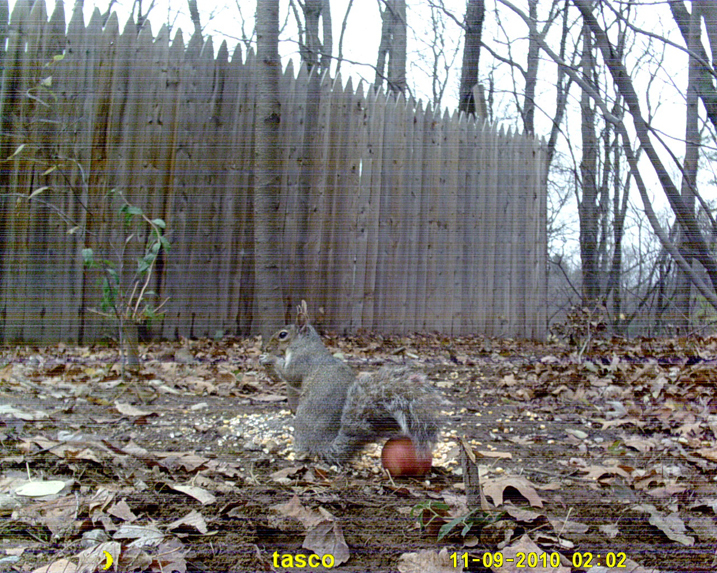 I put out my first camera in October. 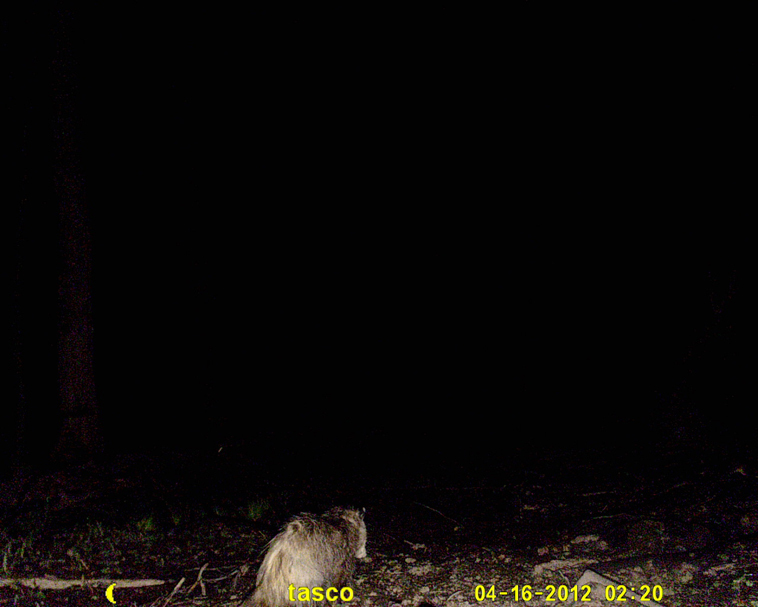 After hanging the camera about a week later or so I finally went out back to check it. 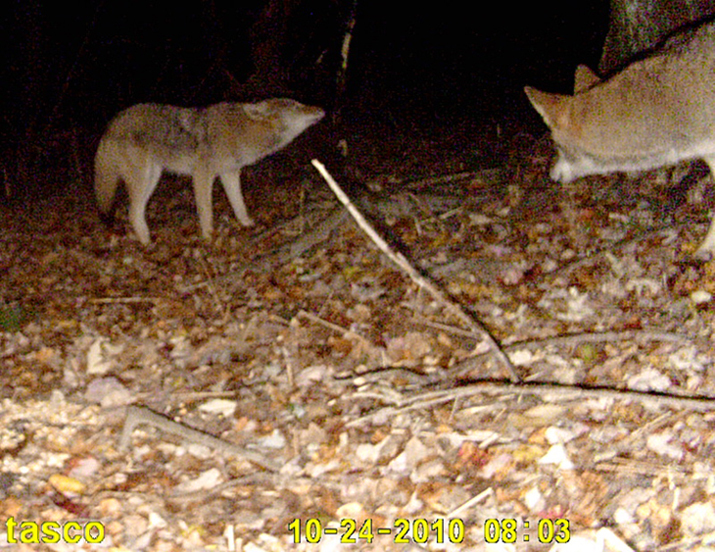 I was not feeling all that optimistic there would be anything on it but after checking it I discovered I had my first wildlife shots, images of a pair of coyotes. 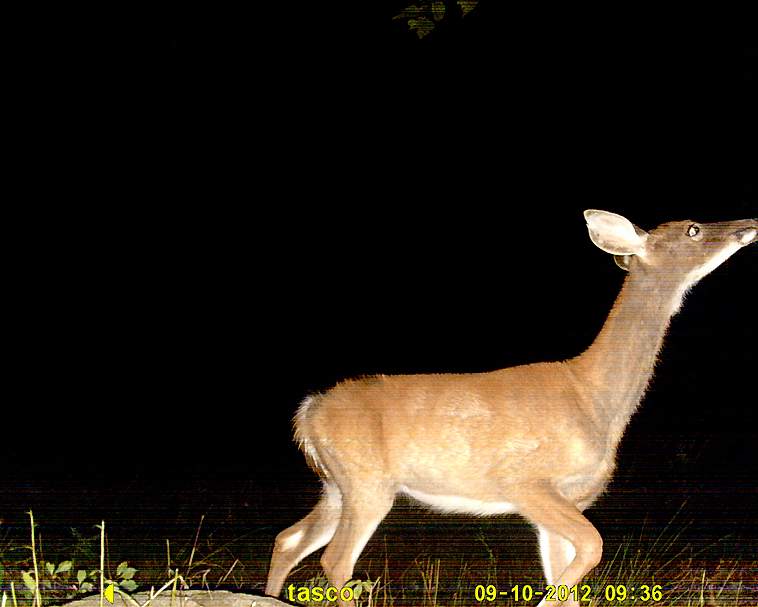 Though I had hoped for deer I was still pleased with the shots. 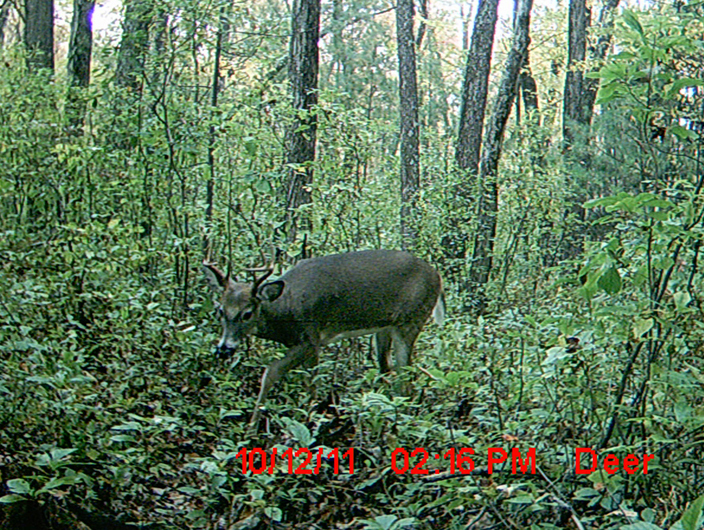 A week later I checked it again and picked up a couple of shots of a small buck. 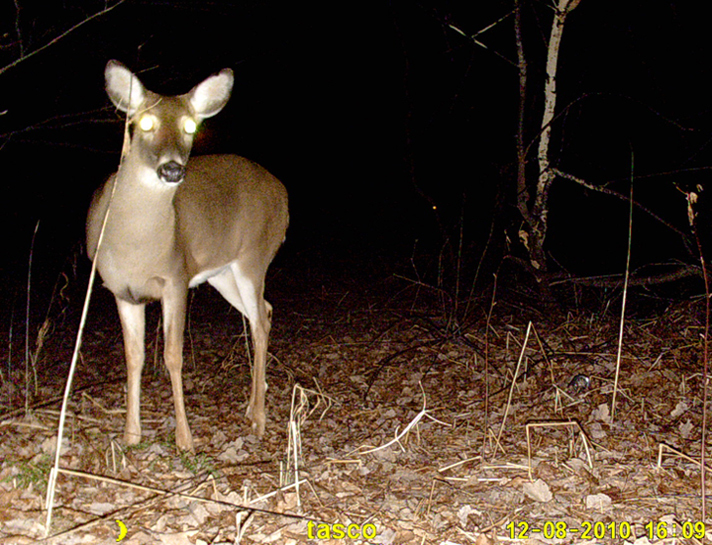 I thought to myself now were talking, there is life out here. 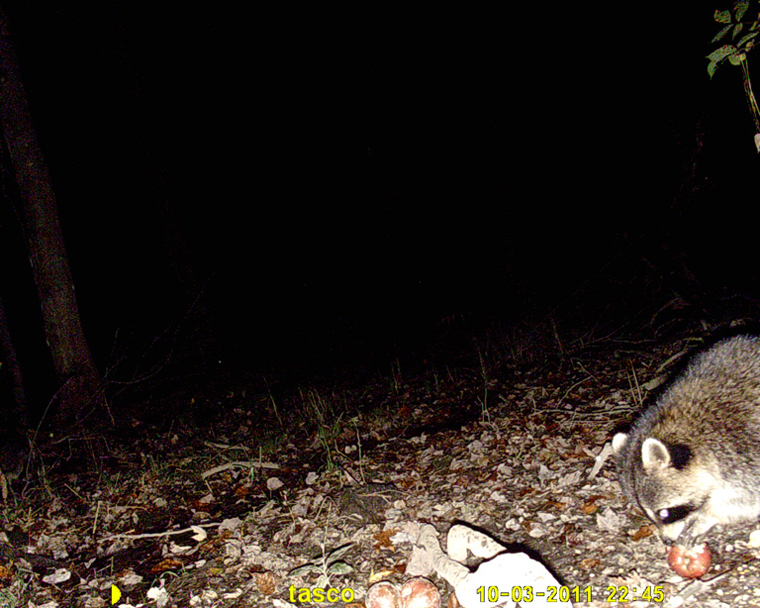 I was enjoying the camera, so I decided to purchase a couple more and hung them deep enough in the woods, where I could hunt without scaring my neighbors. 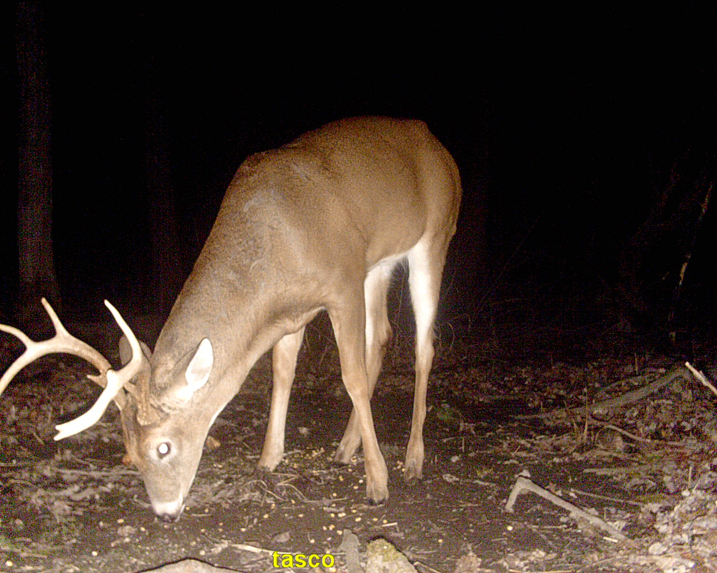 The trail cameras became more than just tools for my hunting; they became an extended hobby to my hunting. 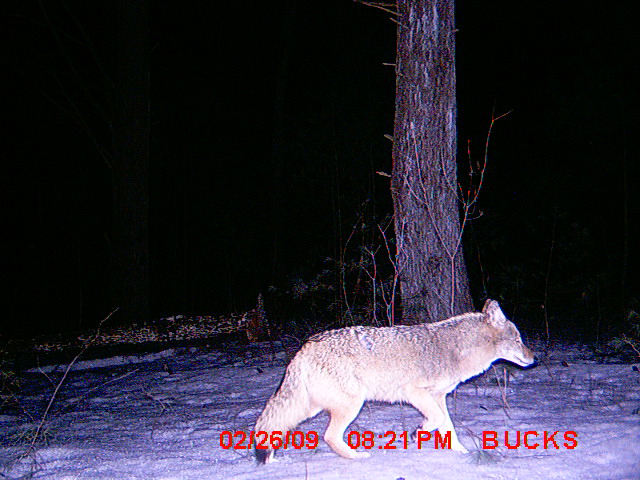 Over the season I was enjoying capturing more images of deer, coyote and fox. 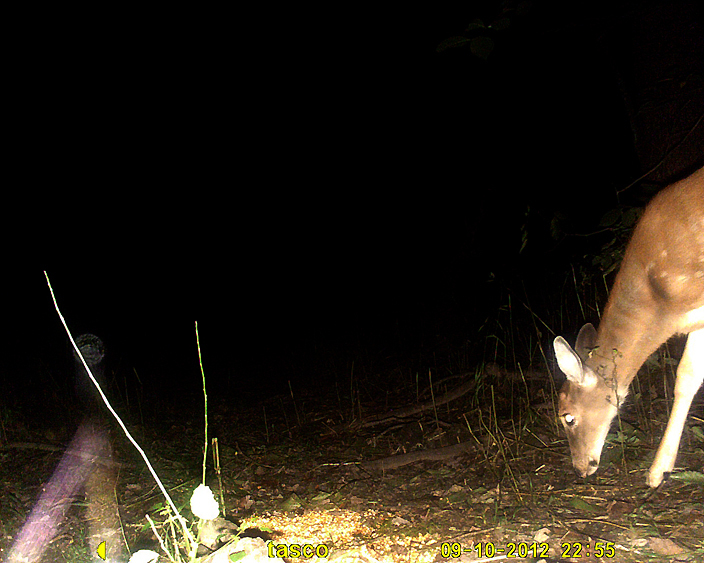 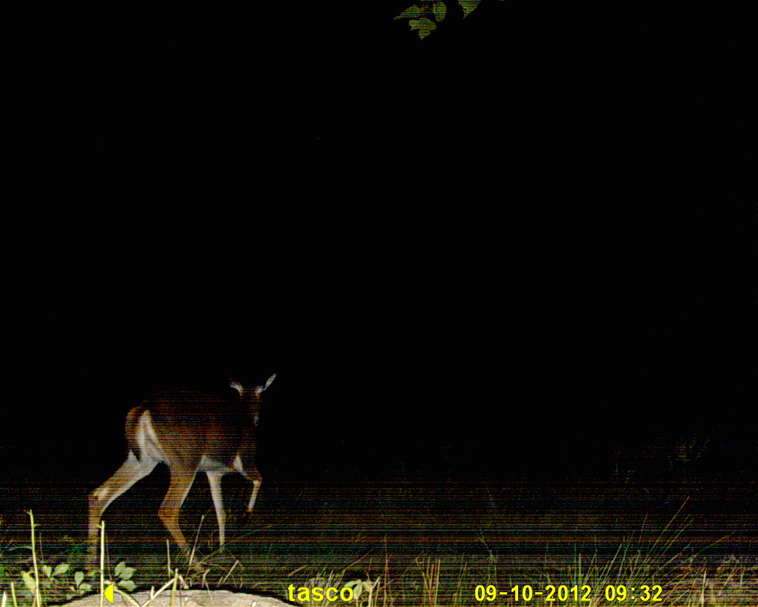 Especially one big buck in particular, unfortunately all the animals are nocturnal. 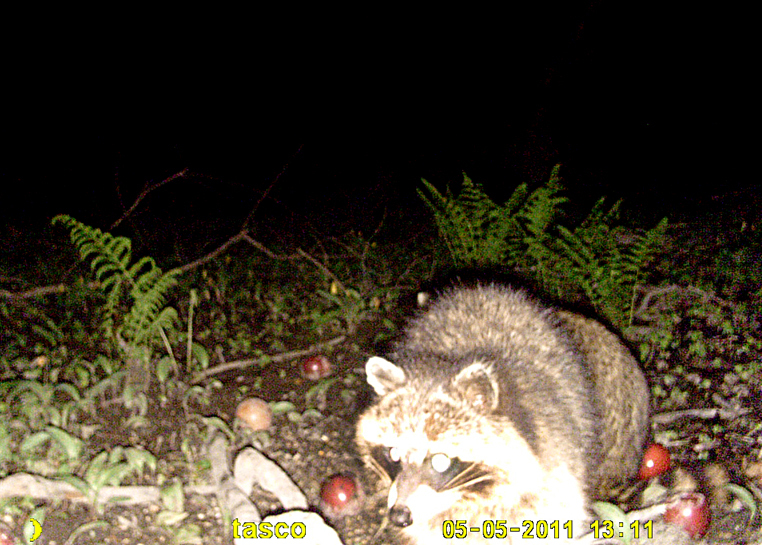 Not one daytime shot of any of these critters. 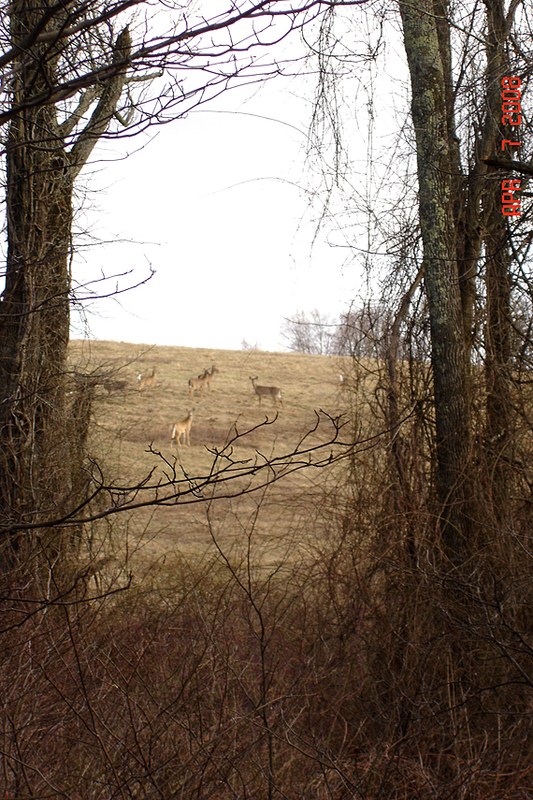 Nor did I see anything while hunting on stand back there. 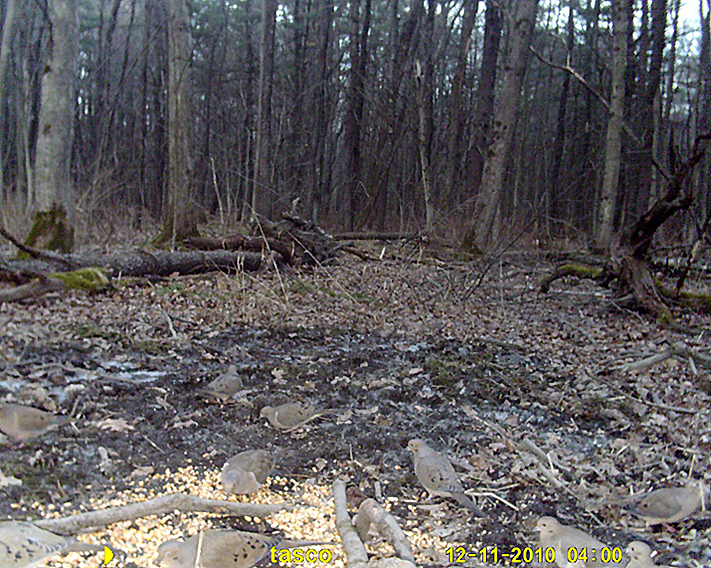 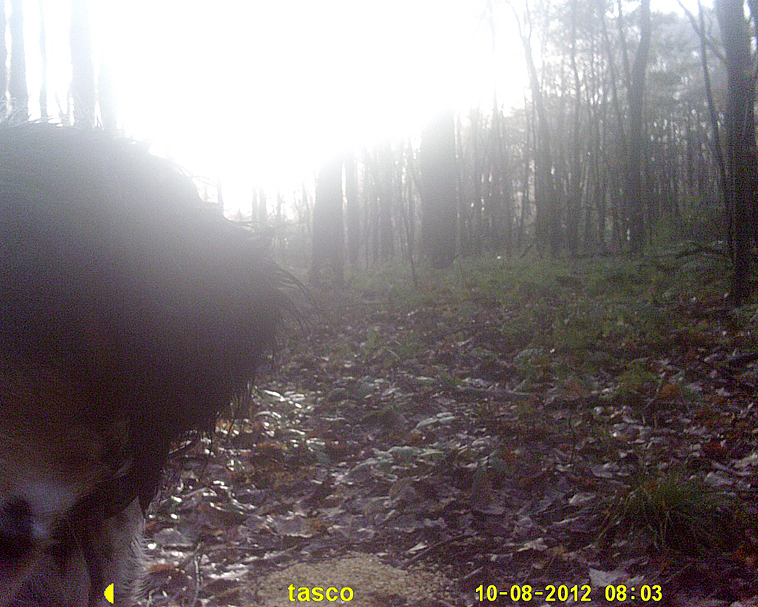 There was one day though, a Sunday and I decided to check the trail cam around 3 PM. 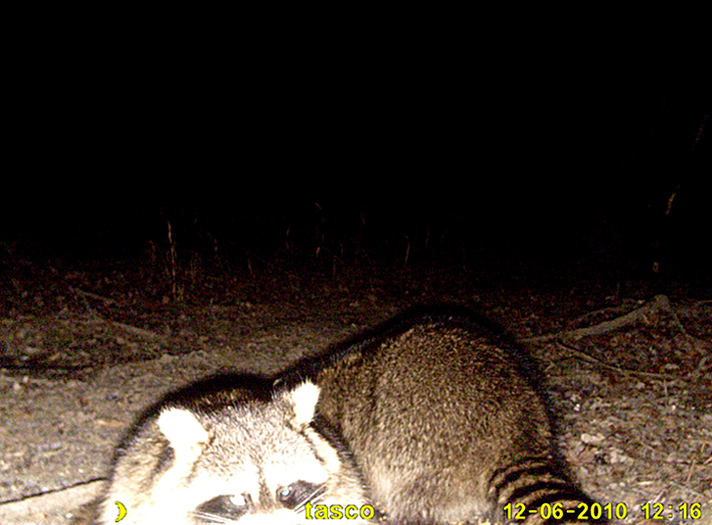 I walked slowly while surveying the area until I got to the camera, I looked all around before bending down to check it but when I popped my head back up there he was! 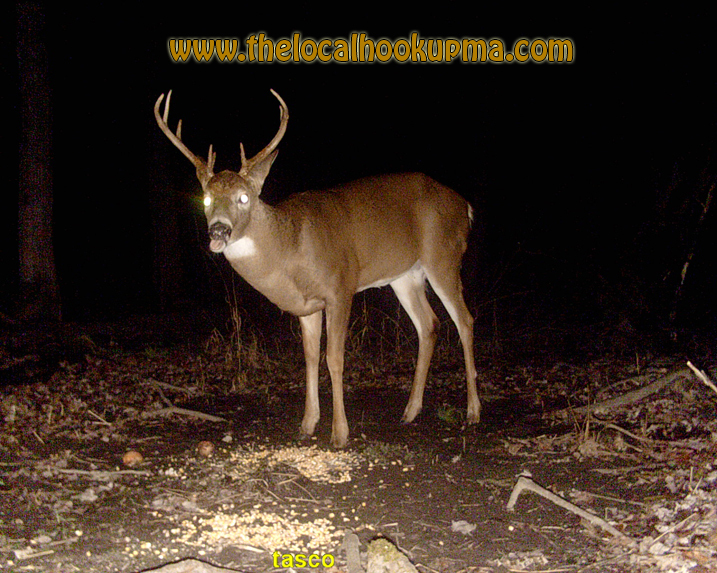 The big buck I had captured many images of feeding at night, staring right at me for about 5 seconds or so, and then he turned around and bolted. 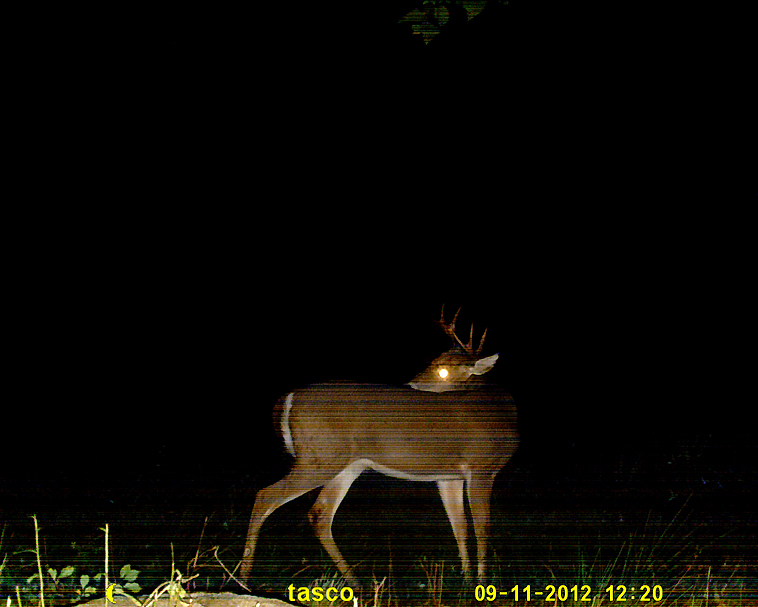 Unfortunately after that encounter I had never seen or captured any images of that buck again. 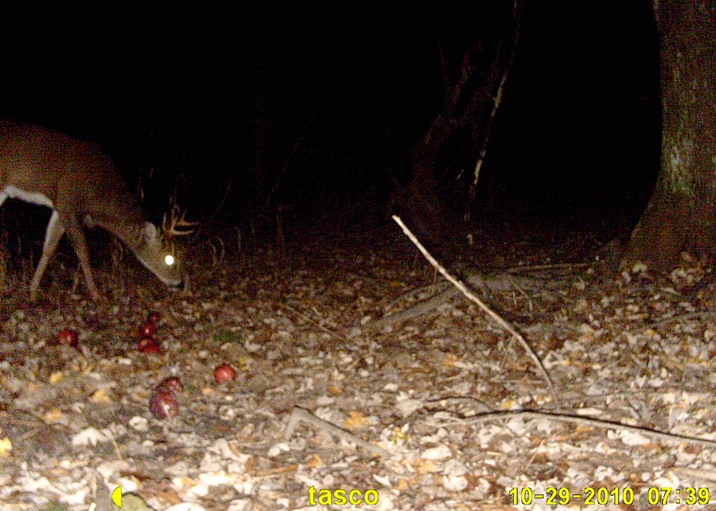 Also unfortunate for me the one time this buck was breaking his nightly routine and coming by for a little day-time snack, I did not have my bow, due to there being no hunting allowed on Sundays in Massachusetts (which by the way I find absurd). 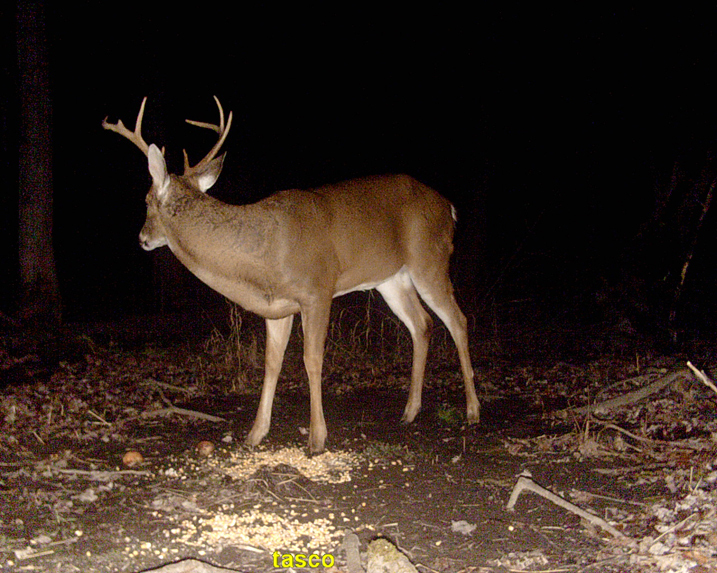 I’m hoping he survived this past hunting season and that I encounter him again next season when his rack has grown even larger and with weapon at hand. 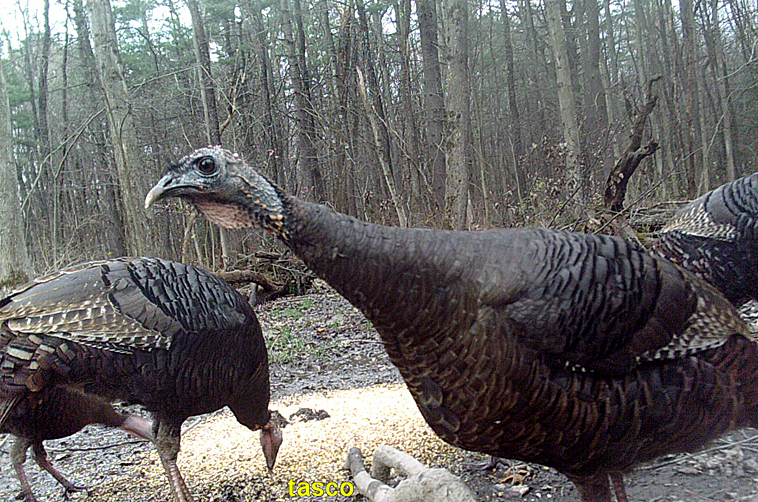 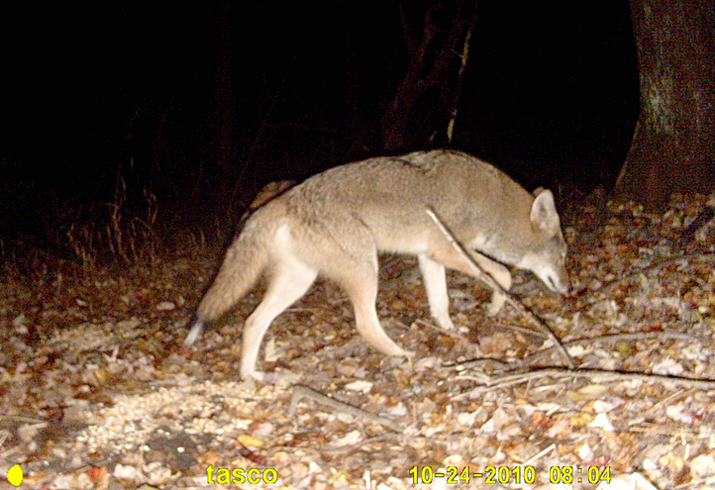 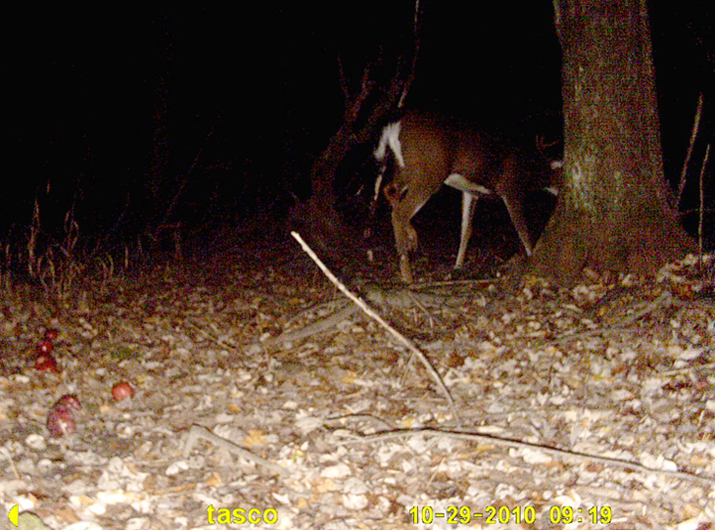 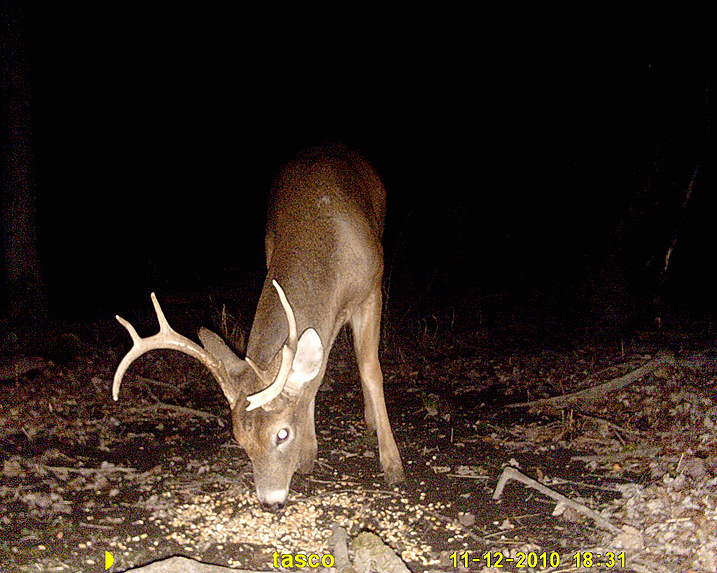 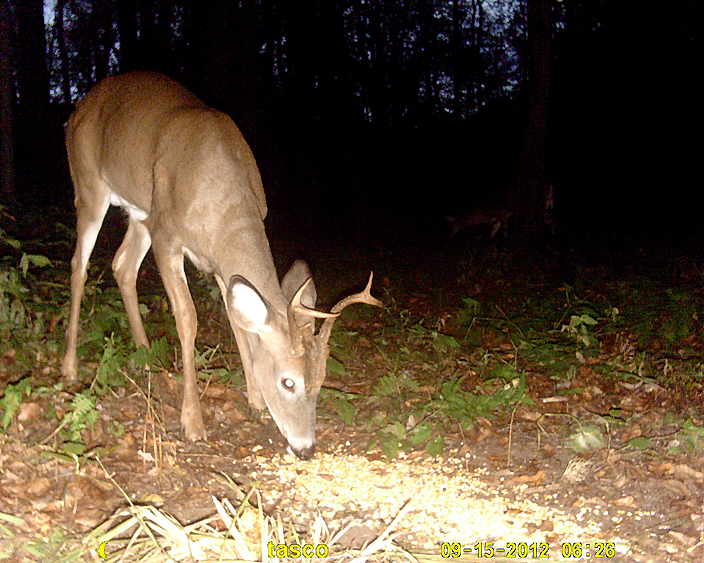 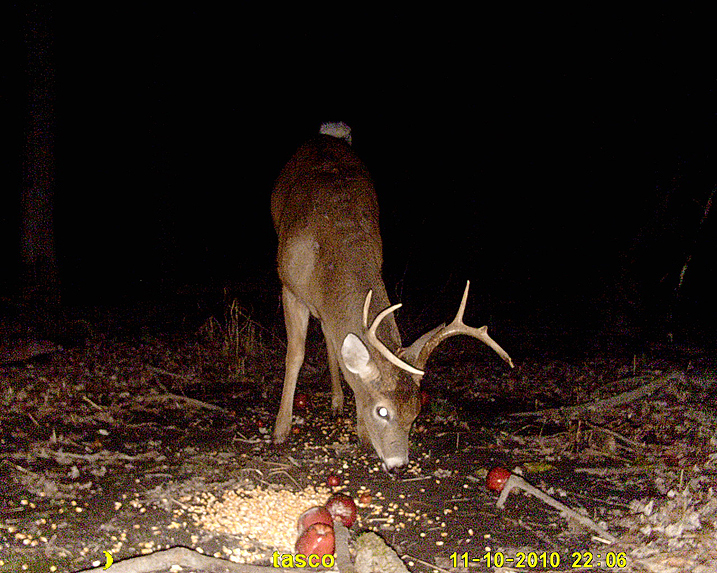 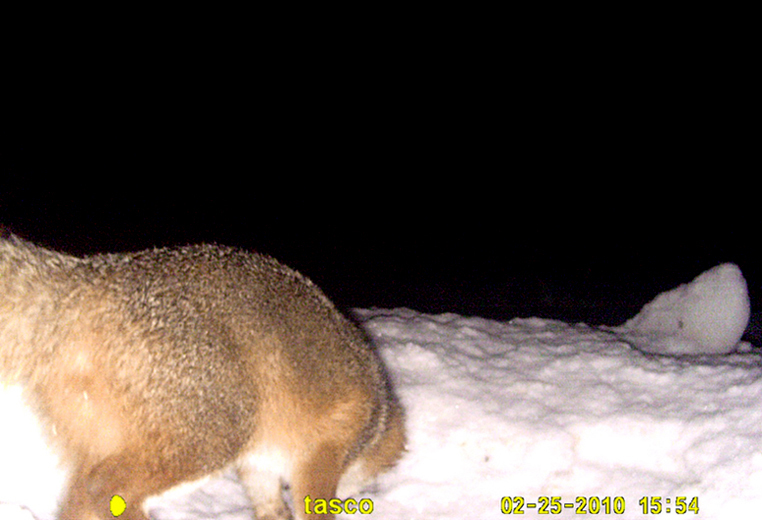 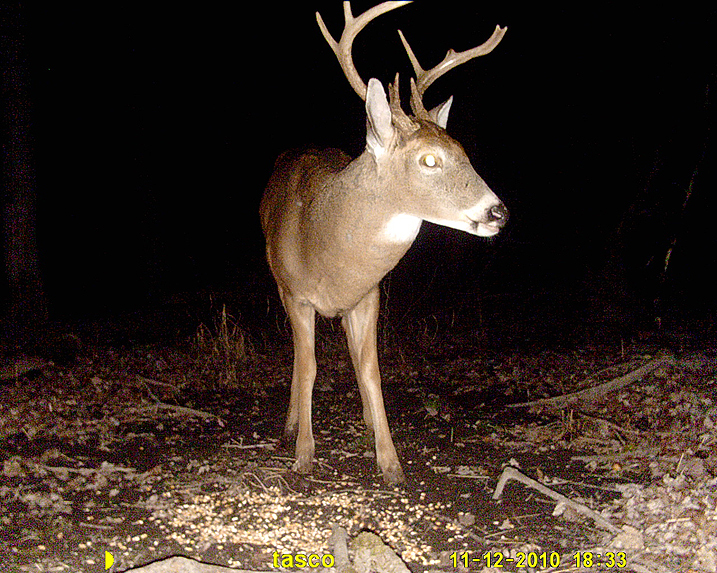 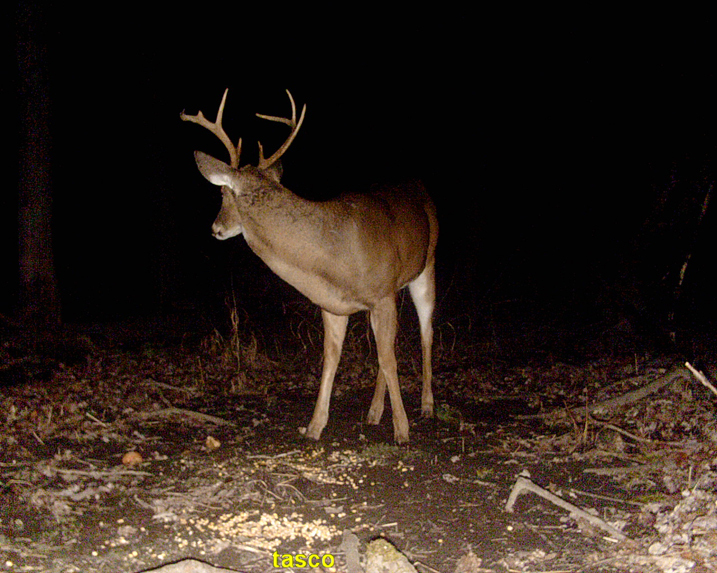 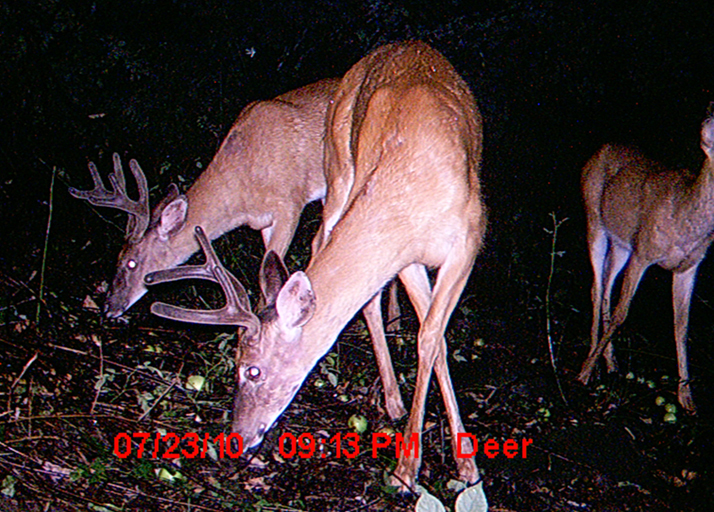 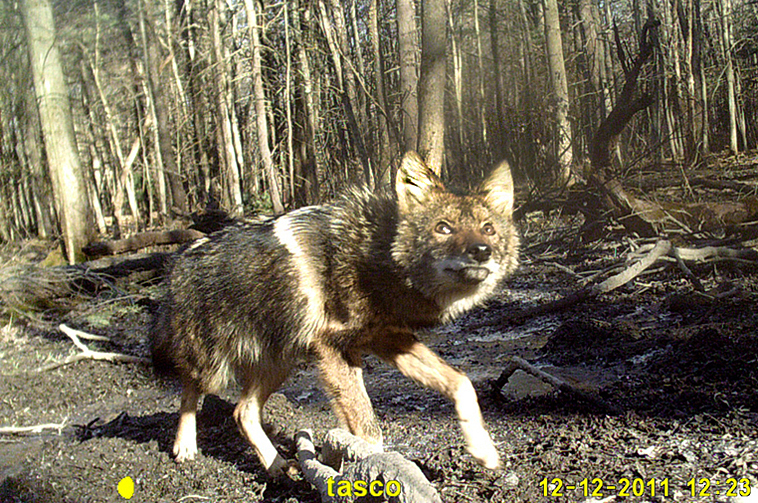 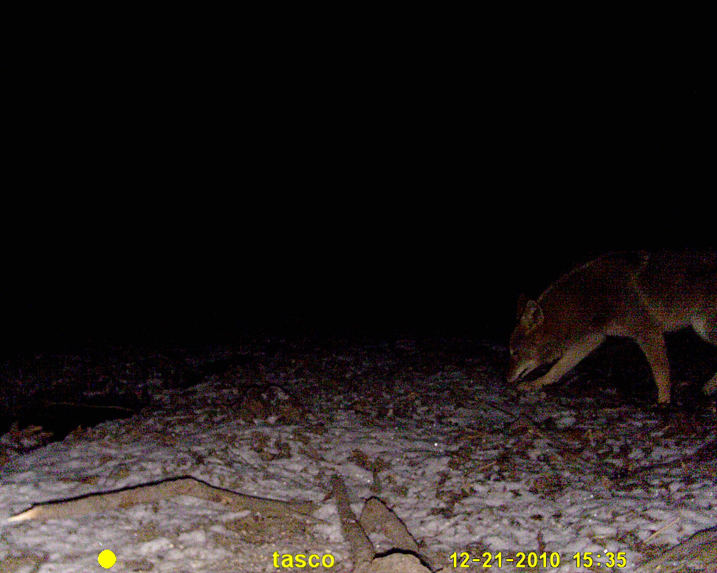 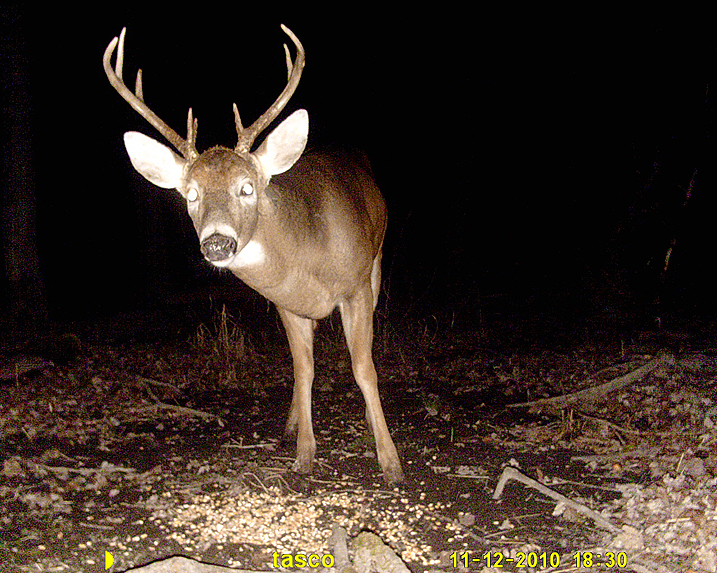 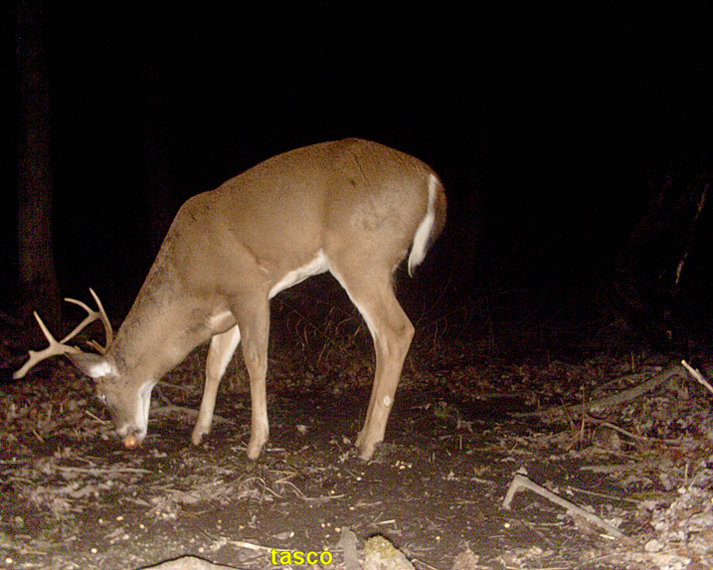 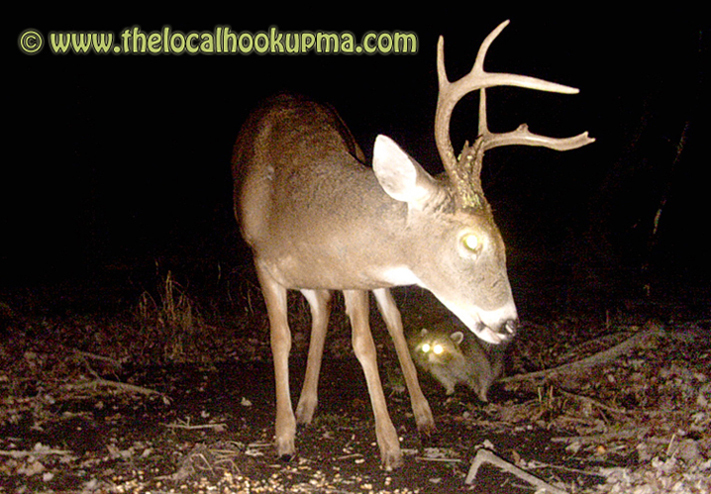 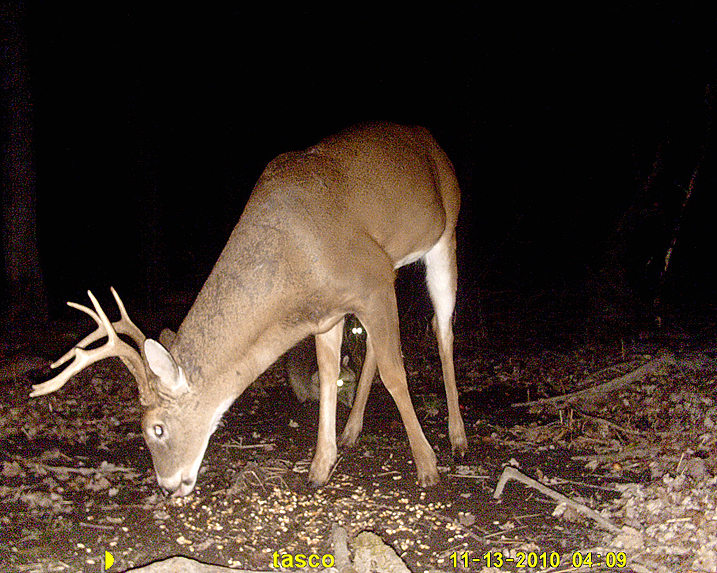 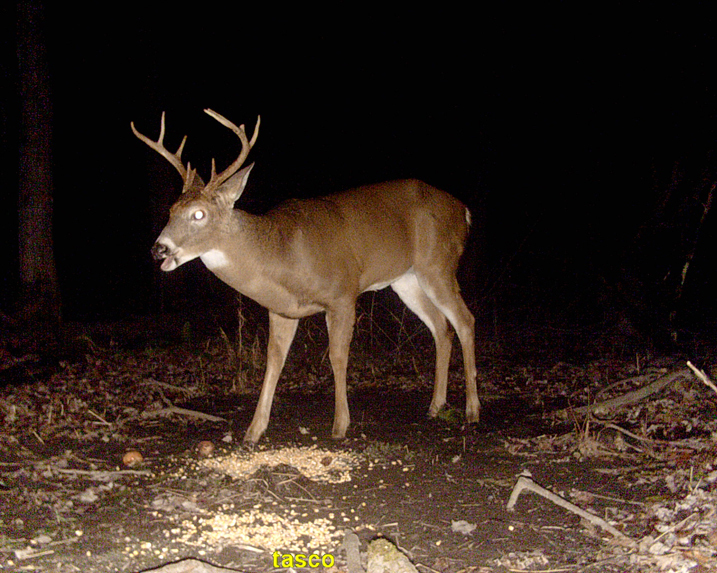 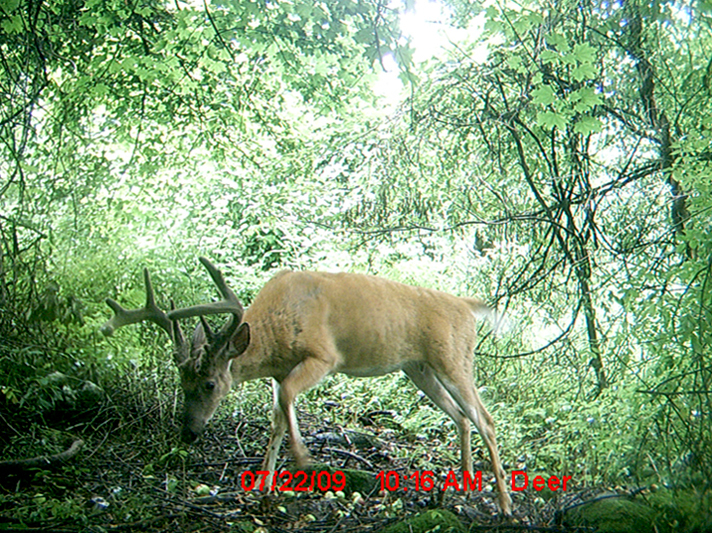 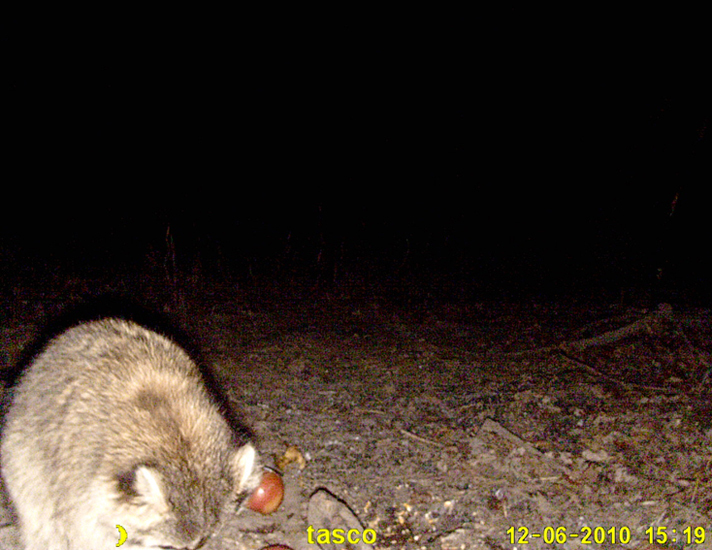 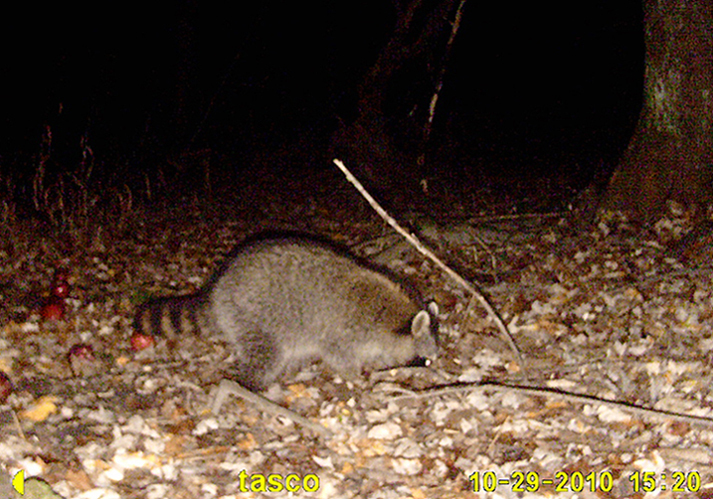 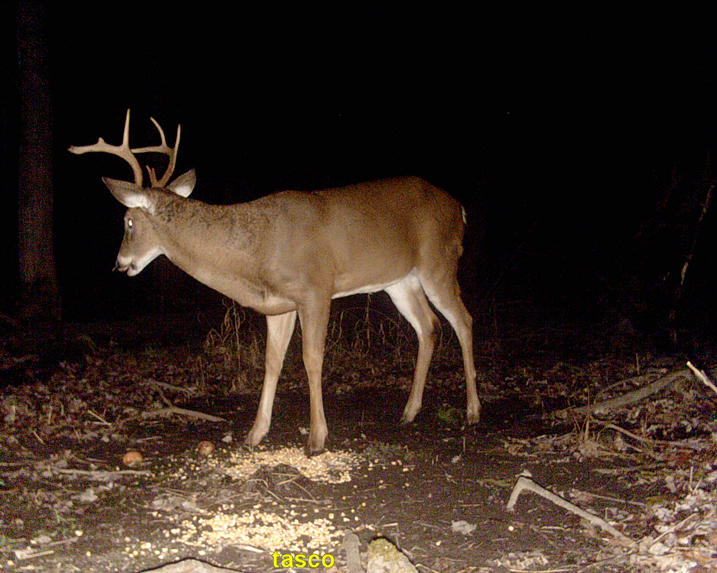 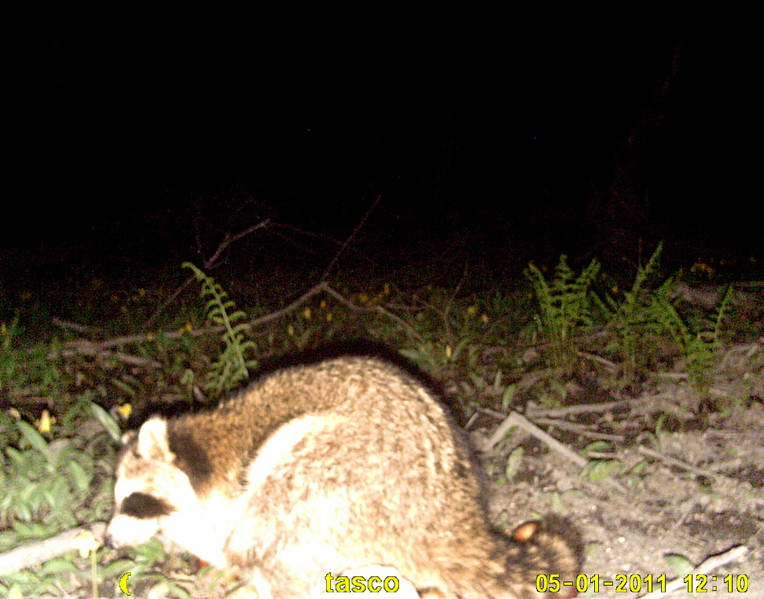 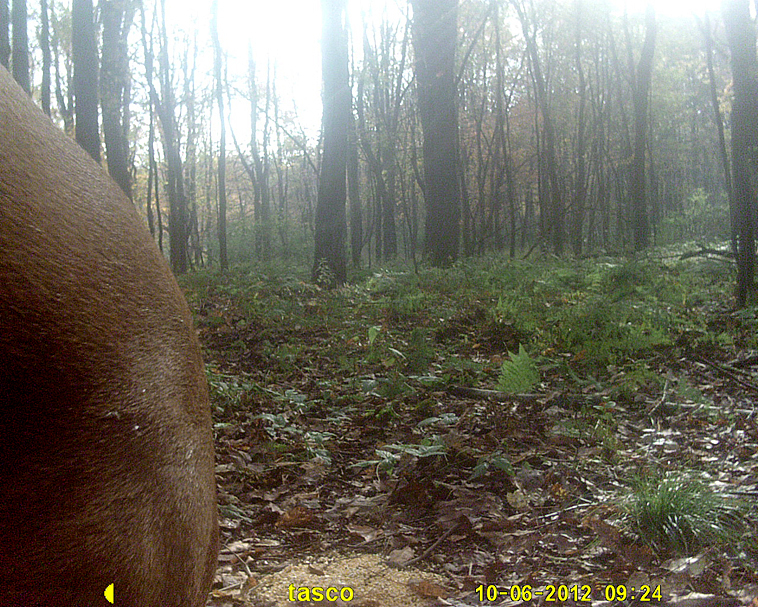 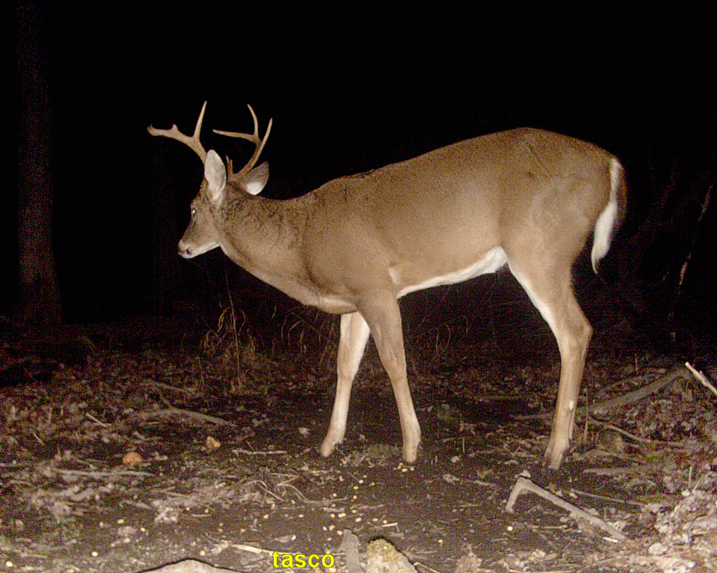 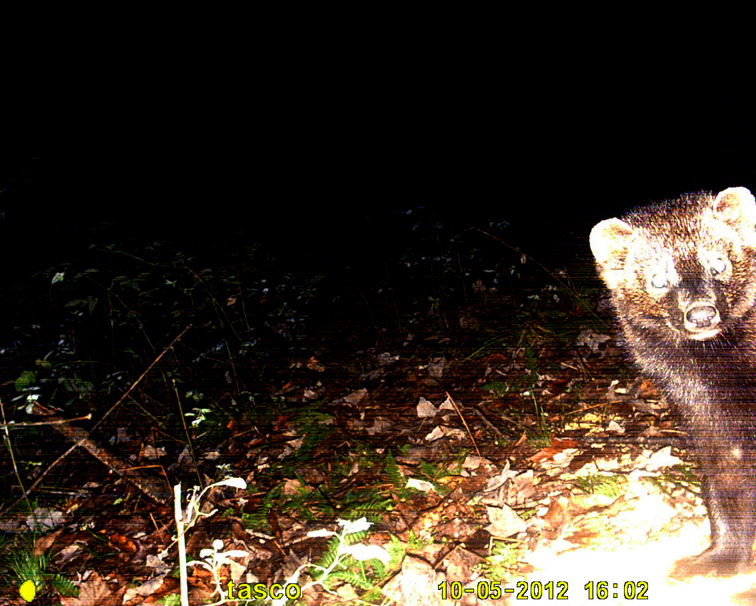 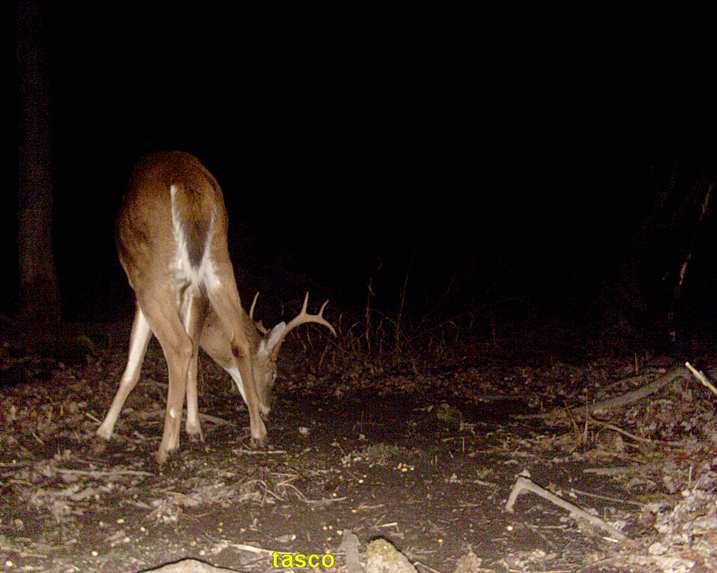 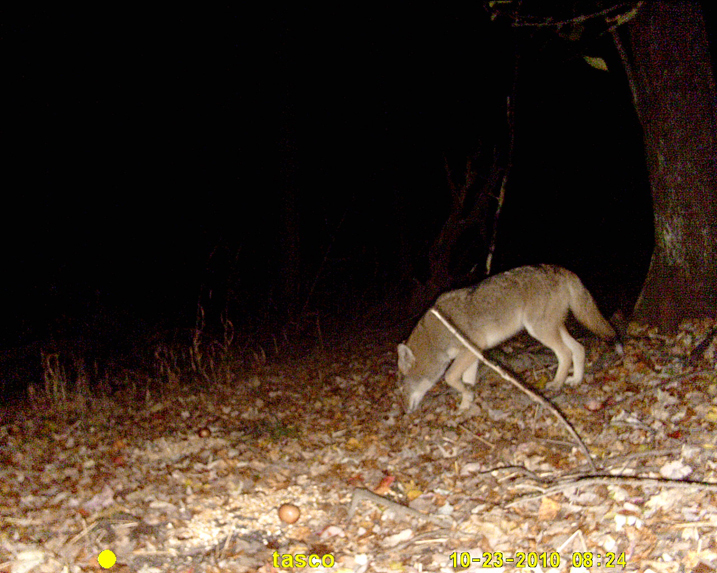 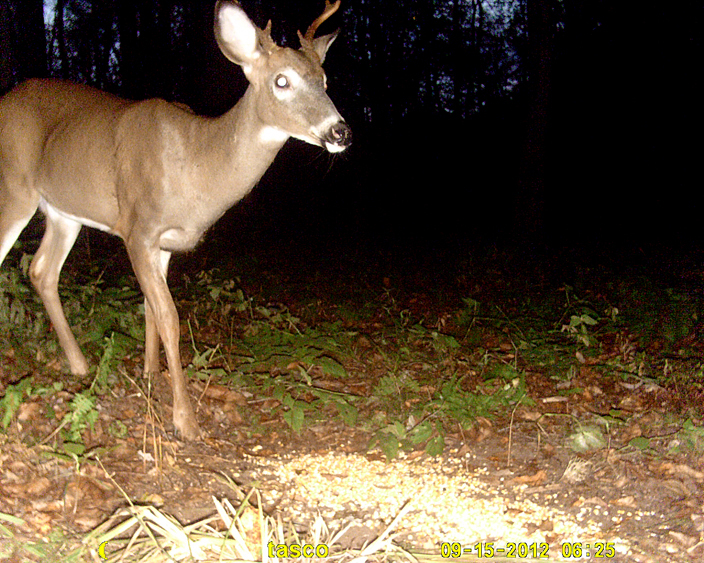 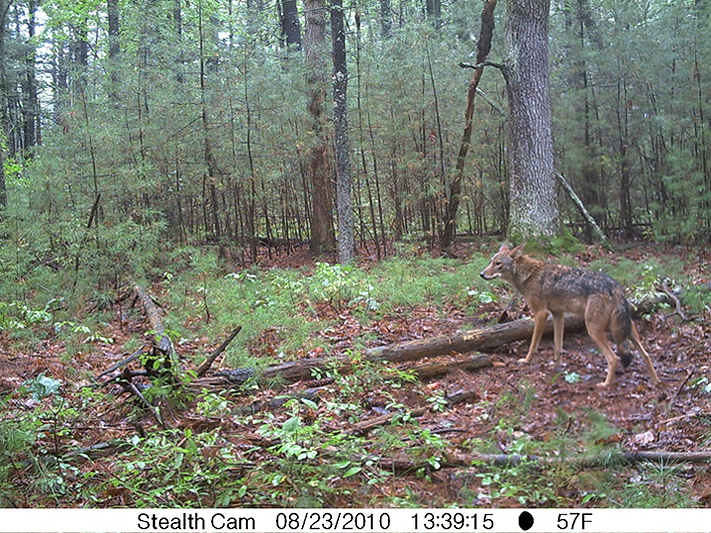 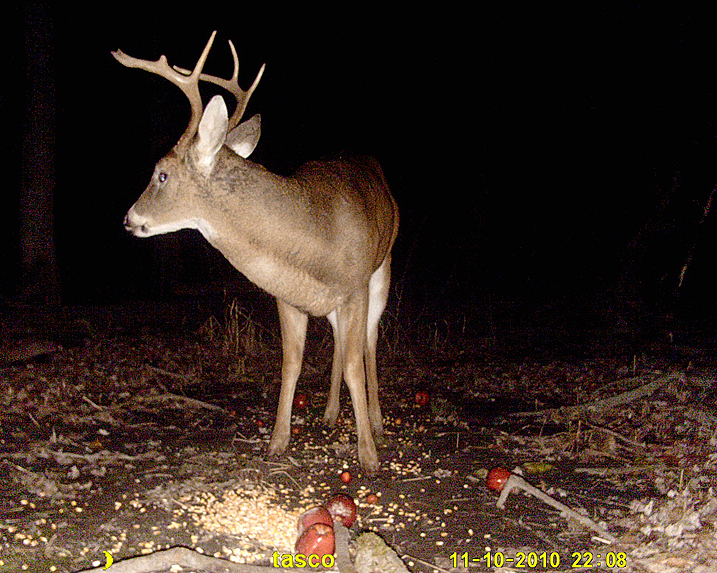 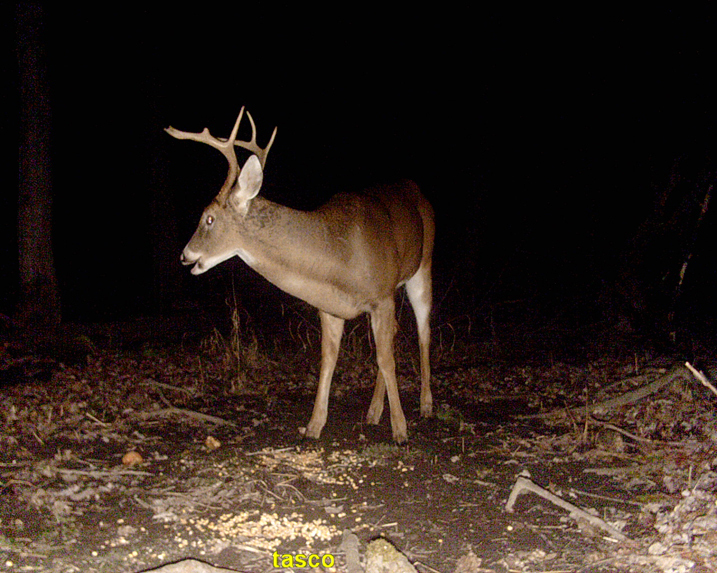 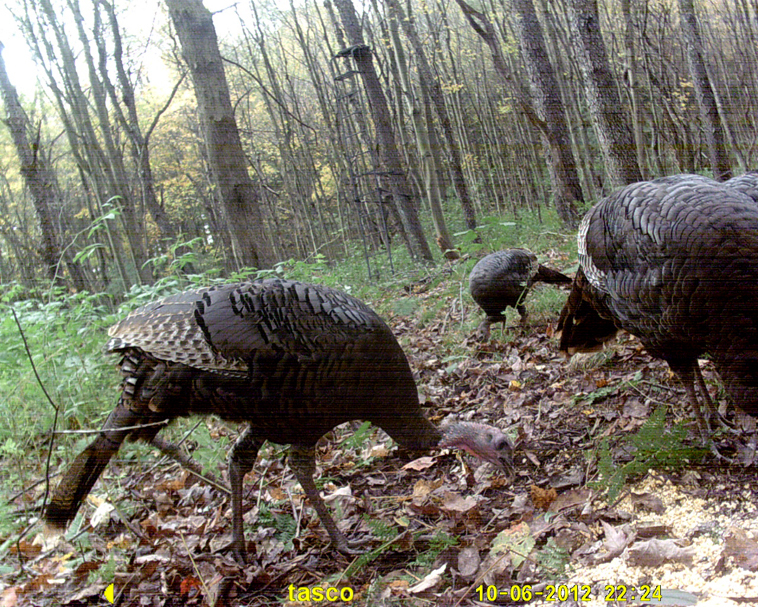 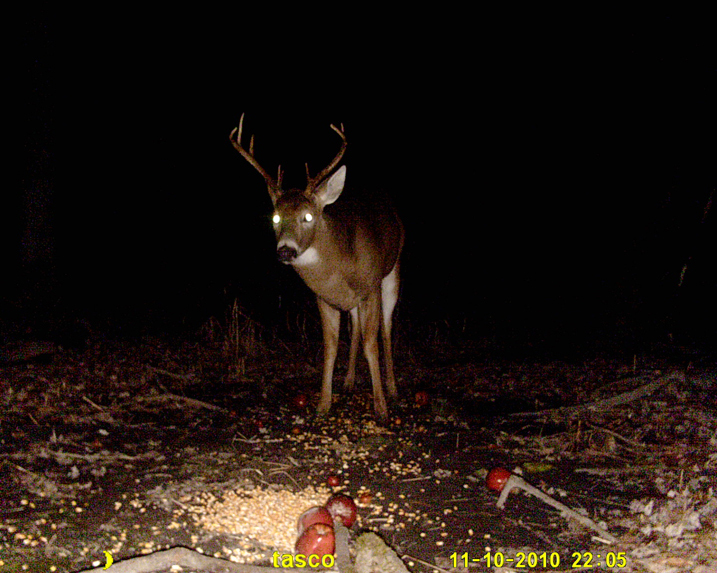 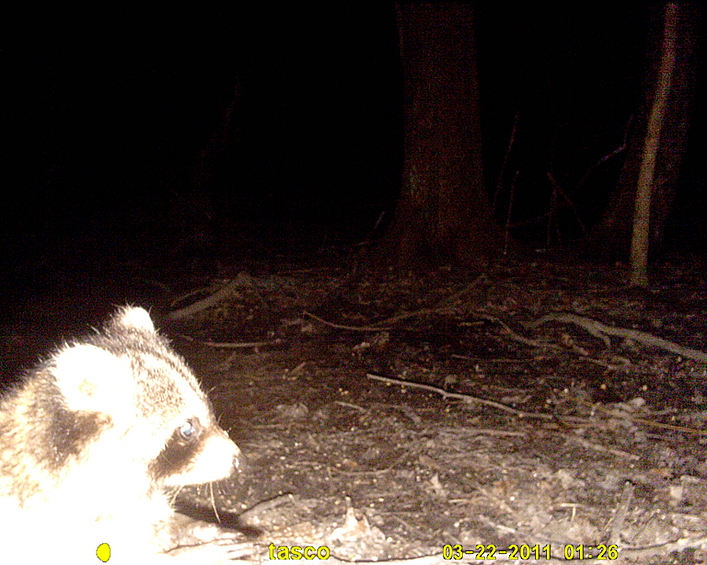 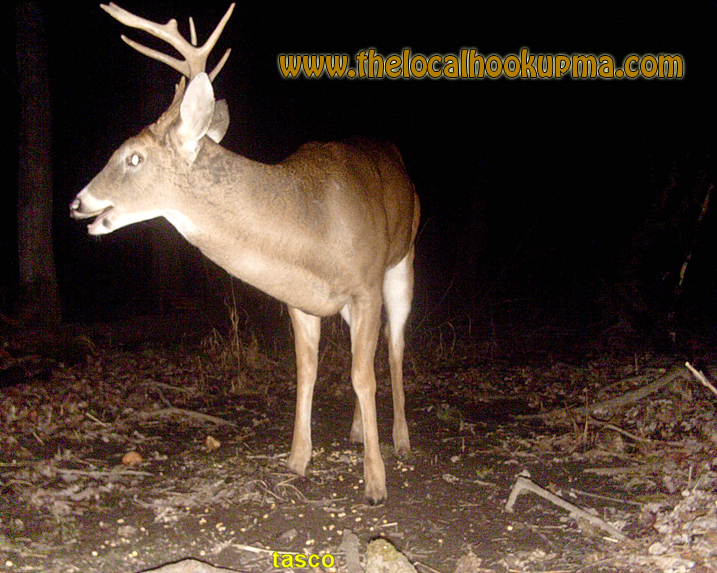 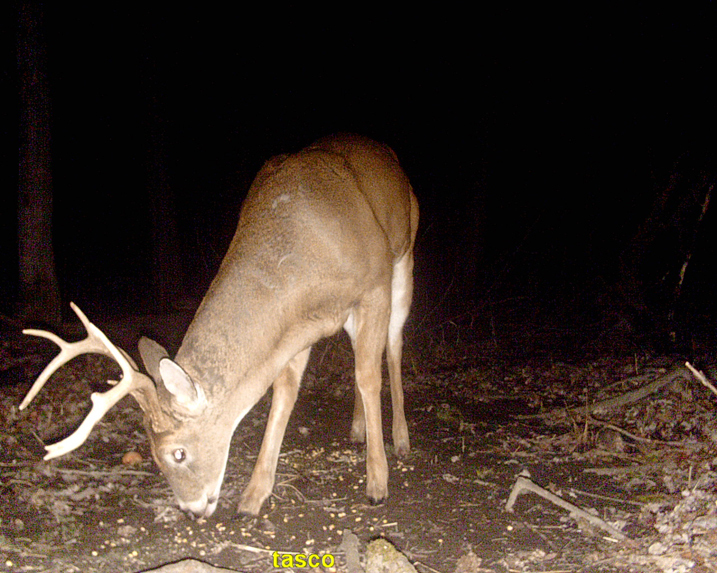 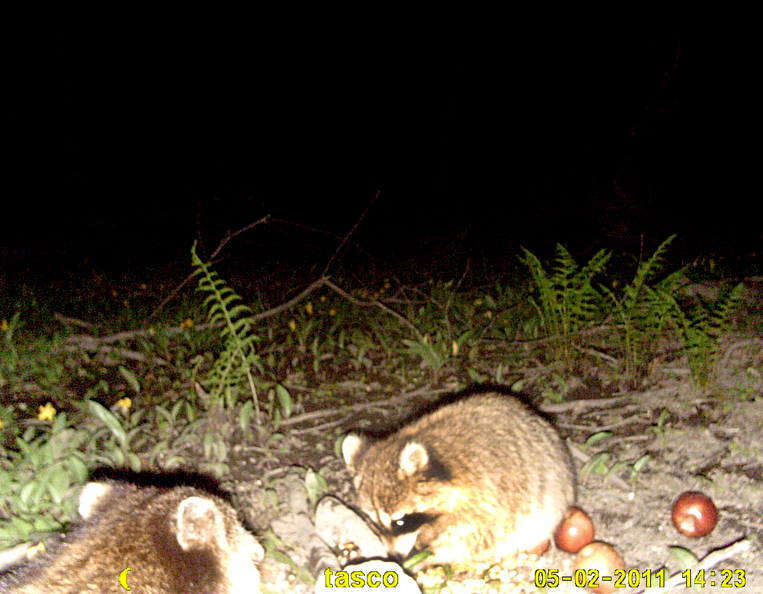 Below are some of the images I captured with the trail cameras this season.